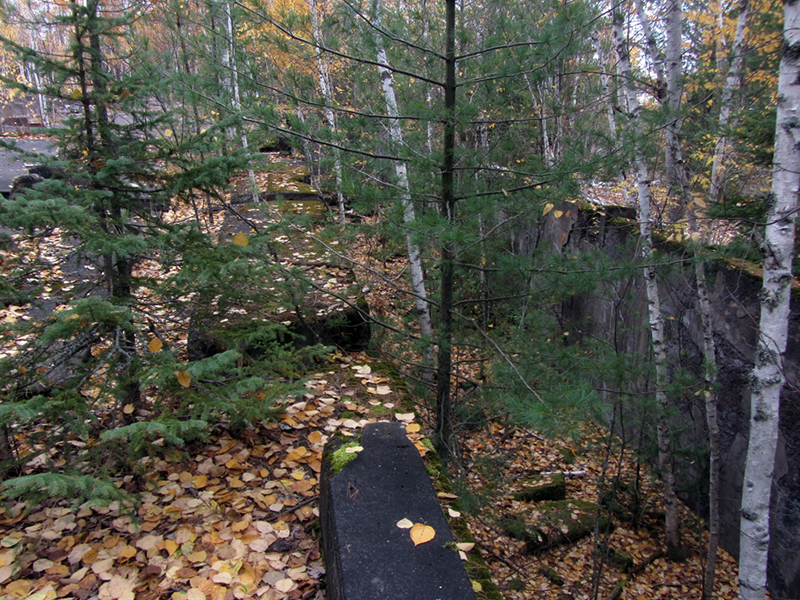 A grim autumn day in the Upper Peninsula is the perfect time to go exploring into the northwoods. 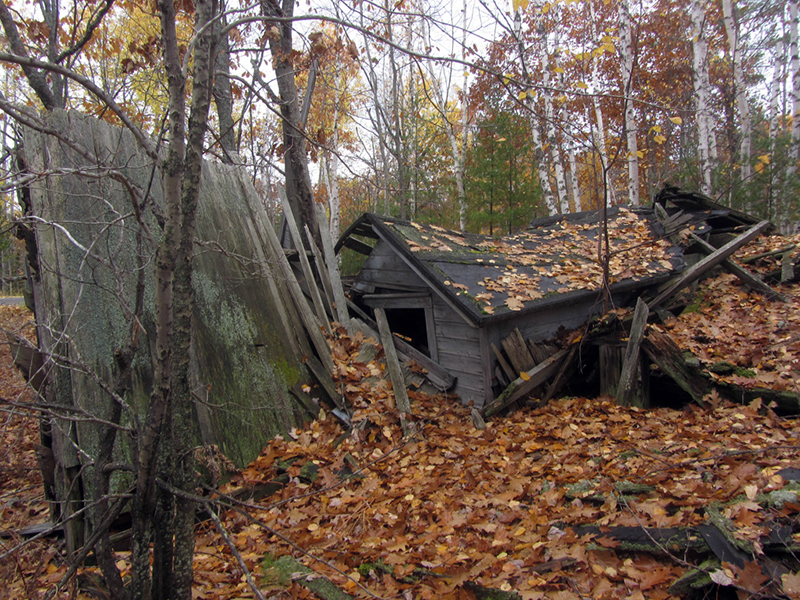 On the shore of the Dollar Peninsula, a few miles west of the abandoned Atlas Powder Co. Plant in Senter, was an area called Point Mills. 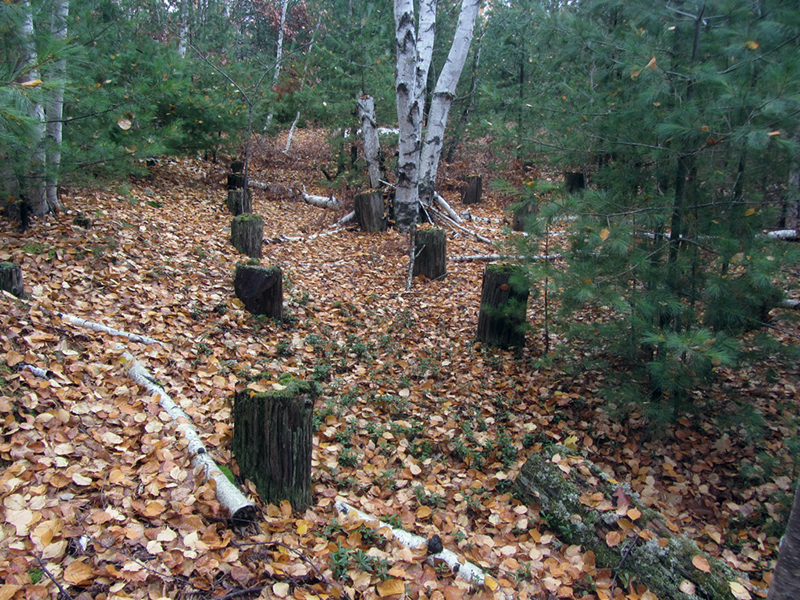 Any stretch of shoreline near Torch Lake or Portage Lake carries the potential for having once been the site of copper milling operations. 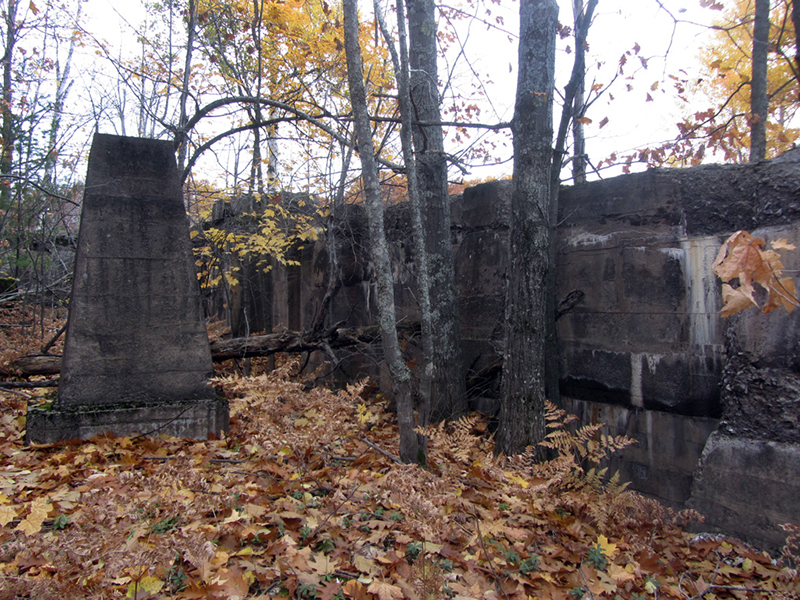 Here, the ruins of the Franklin Stamp Mill and the Arcadian Stamp Mill hide in the woods. 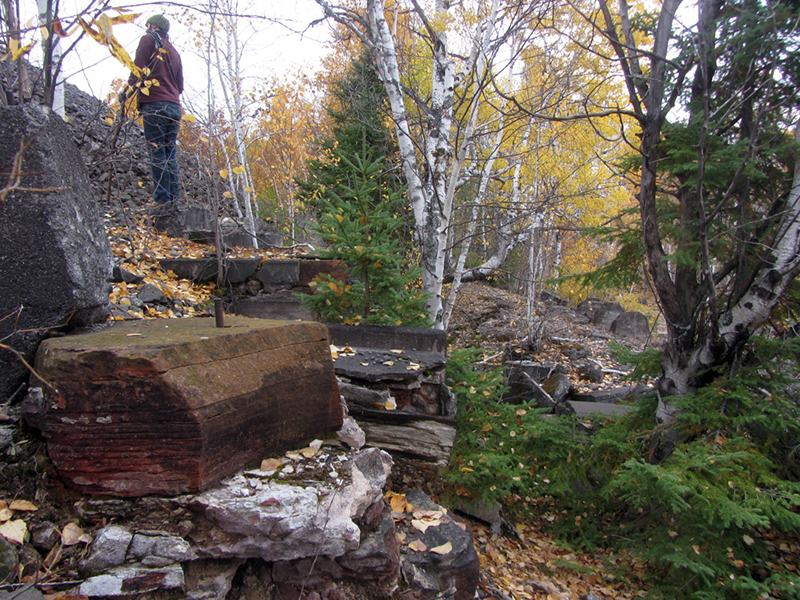 When my Duluth colleagues Ava and Dan (proprietor of substreet.org) came to visit me during one of my autumn Copper Country vacations, Point Mills was one of the places we decided to check out. 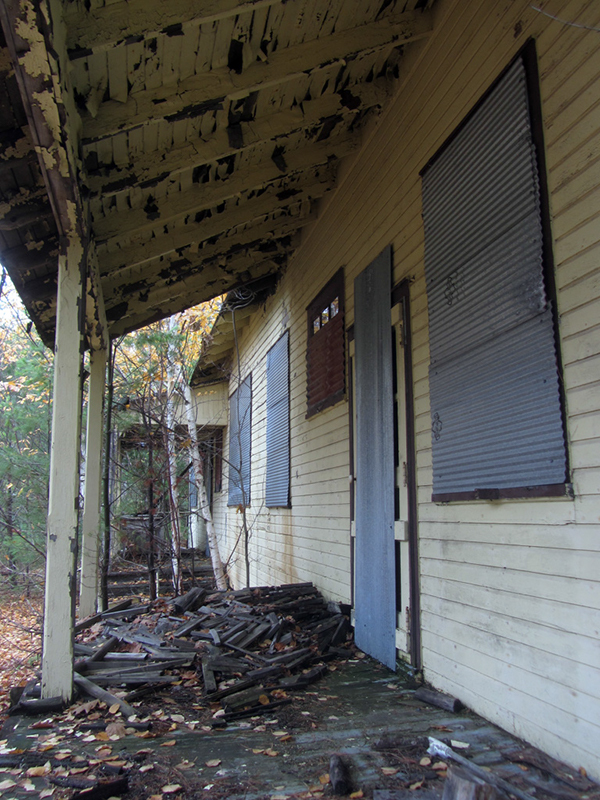 Though we were unable to get to the Franklin Mill, we did scope out the Arcadian. 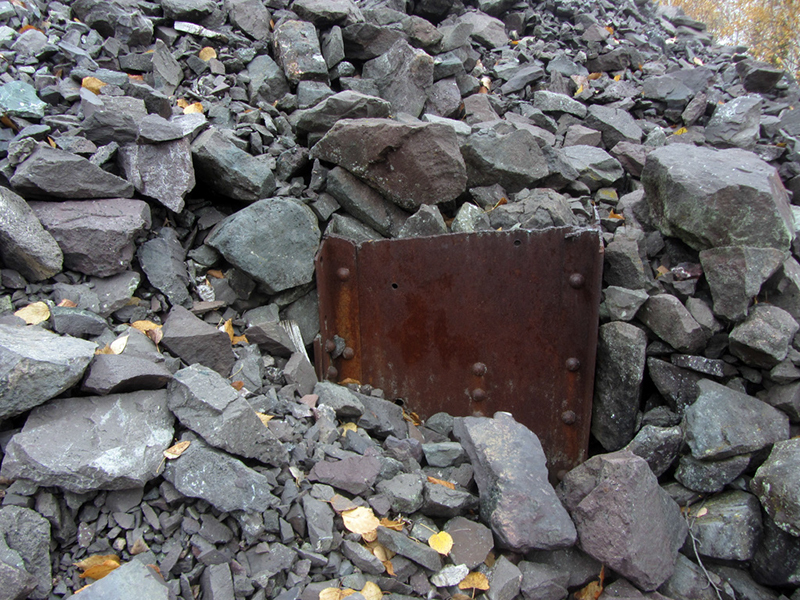 When we came across the remnants of the rock bins, we knew we had found it. 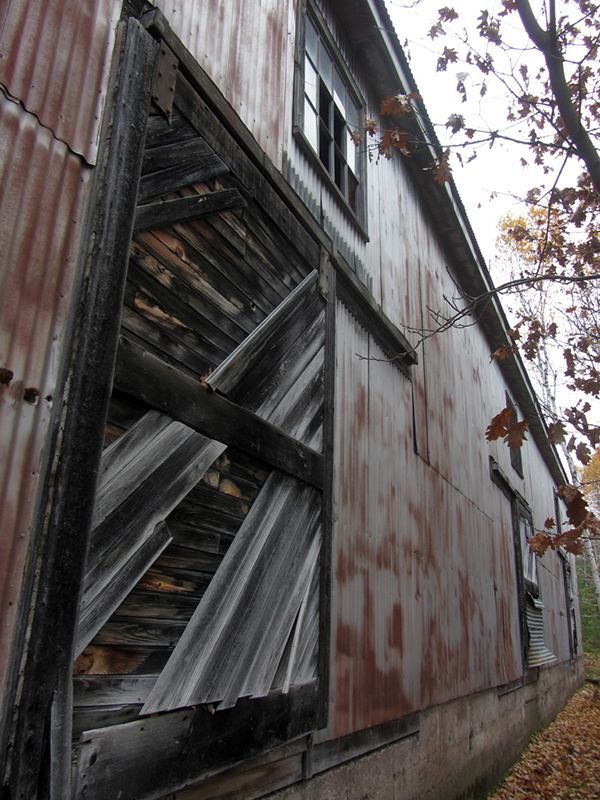 As always, the metal portions of the mill (namely its walls and roof!) had been removed long ago for scrap. 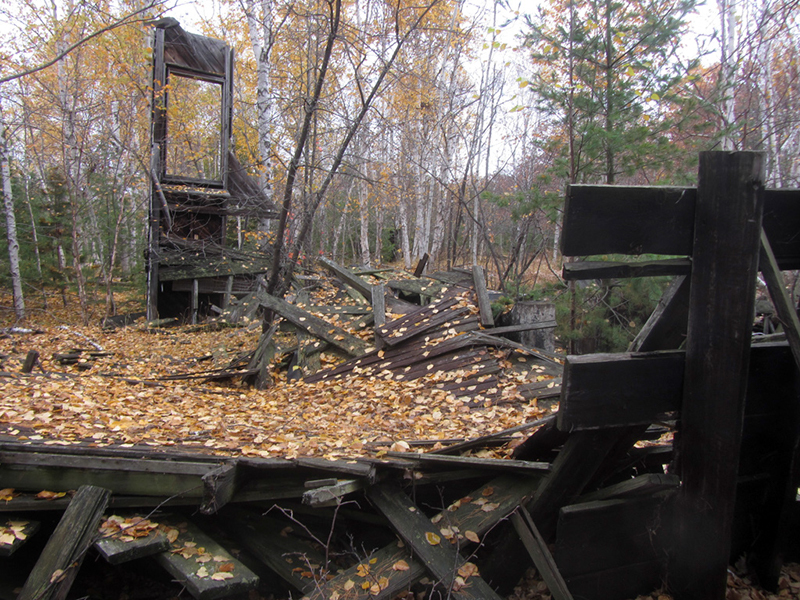 This mill was built by the Arcadian Copper Co. around the year 1900 to process copper ore taken out of the Arcadian Mine, whose ruins are located just a few miles away from here. 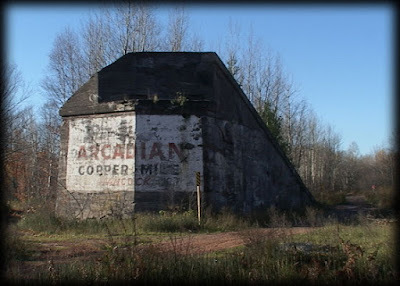 The owners of Arcadian apparently felt pretty confident in their venture before they even started mining–they dumped a lot of capital into building impressive surface structures for the mine according to Mike Forgrave of CopperCountryExplorer, but sadly the Arcadian Mine never really produced any significant copper. 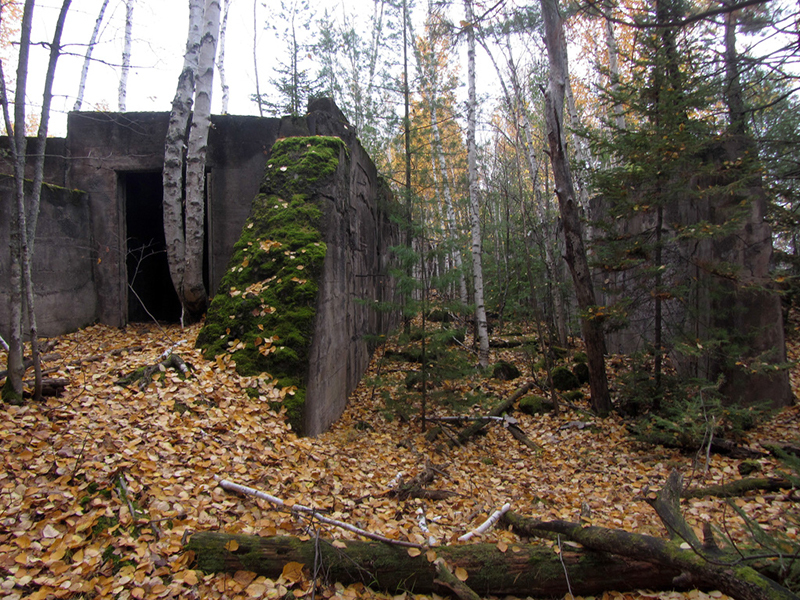 There was a time when the rumor going around was that any hole that was dug anywhere in the Keweenaw Peninsula would lead to copper riches, and apparently the Arcadian's investors still believed that. 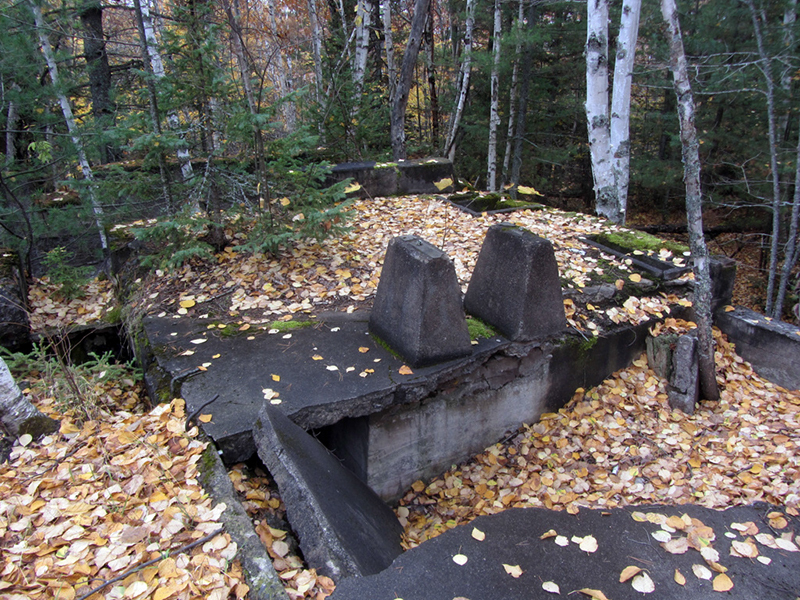 I have also explored and written about other stamp mills in the Copper Country in these posts: Of Stamps, & Smelters (Part 1), Of Stamps & Smelters (Part 2), Mining in the Clouds, and "Hunting on the King’s Lands". 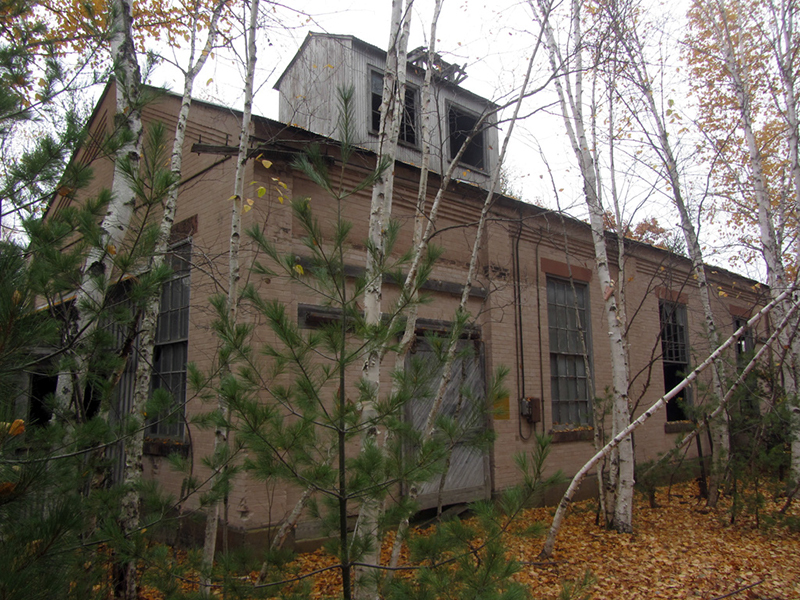 The Centennial modernized and expanded the old Arcadian Mill significantly in 1910, adding three more stamp heads for a total of six, which effectively doubled its output capacity. 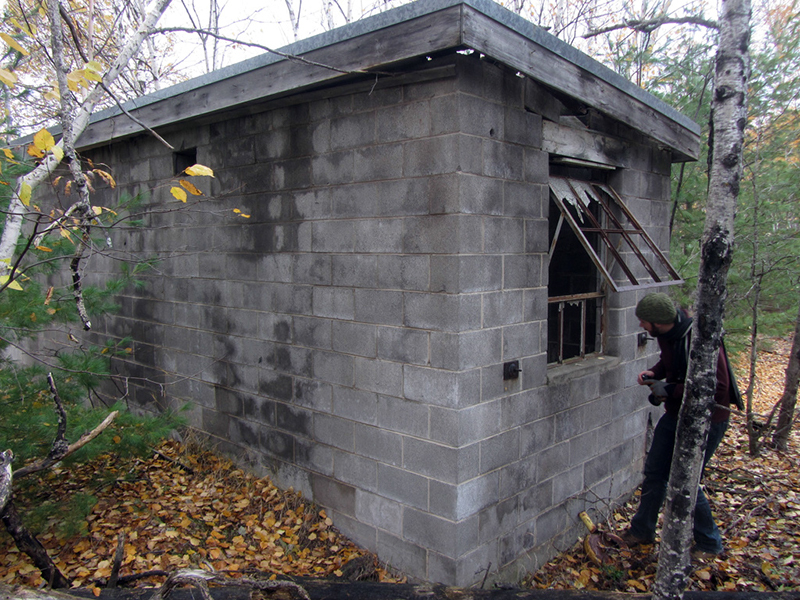 They also added an electric generating station to the boiler house, to power its many wash tables and jigs. 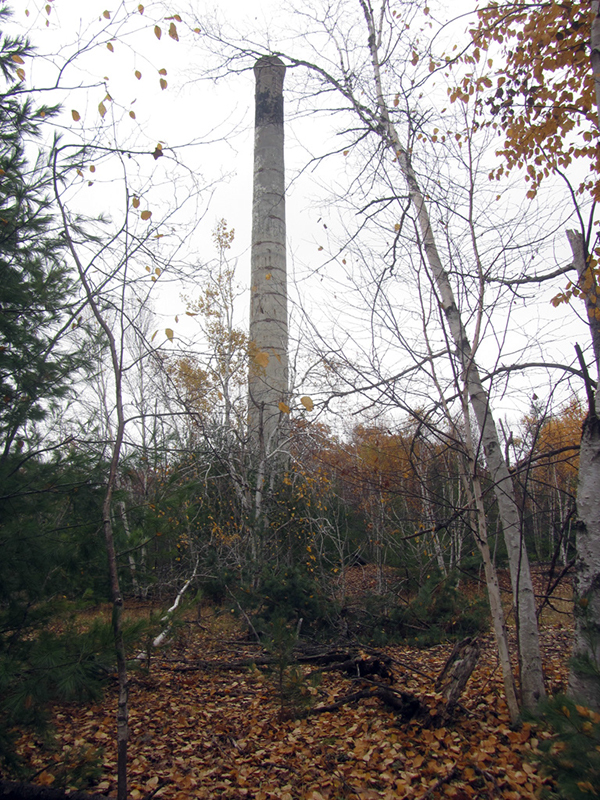 The leaf-covered incline in the foreground is actually the stack's flue. 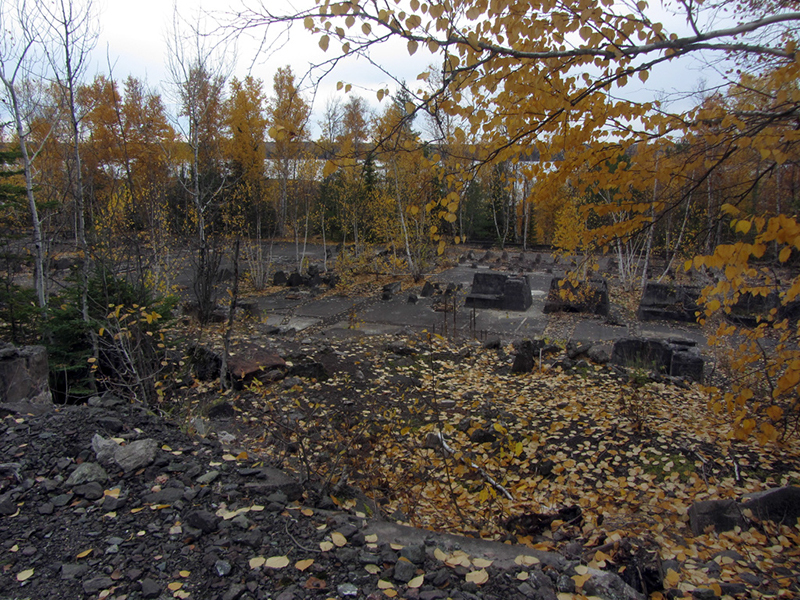 When the massive Calumet & Hecla (C&H) mining conglomerate bought up the Centennial, they acquired this mill as well as the Osceola Mills, the Dollar Bay smelter, the Ahmeek Mill, and two of the Tamarack stamp mills. 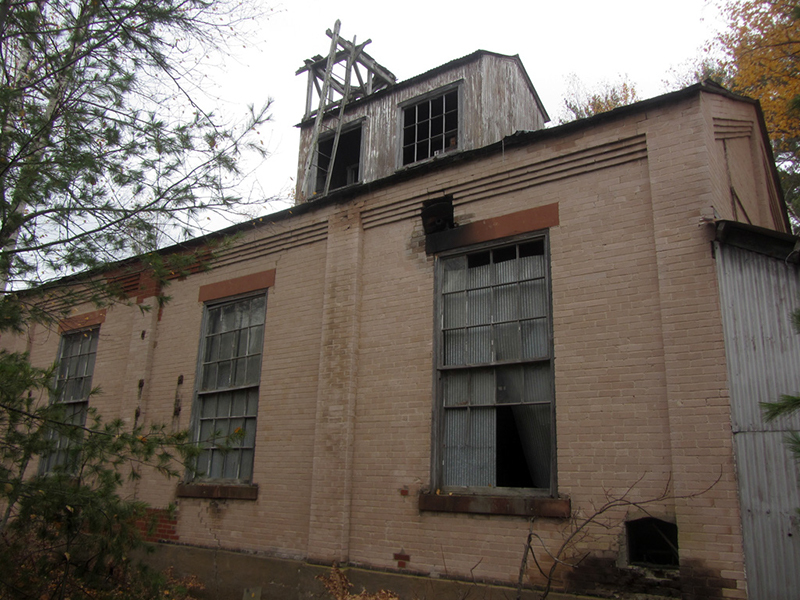 With all these acquisitions in their back pocket, C&H had way more milling capacity than they needed, so they used the Arcadian / Centennial Mill to contract milling services to other independent mines in the Copper Country. Of course they also planned more upgrades and expansion at this mill to handle this increase in work, and make it more efficient. 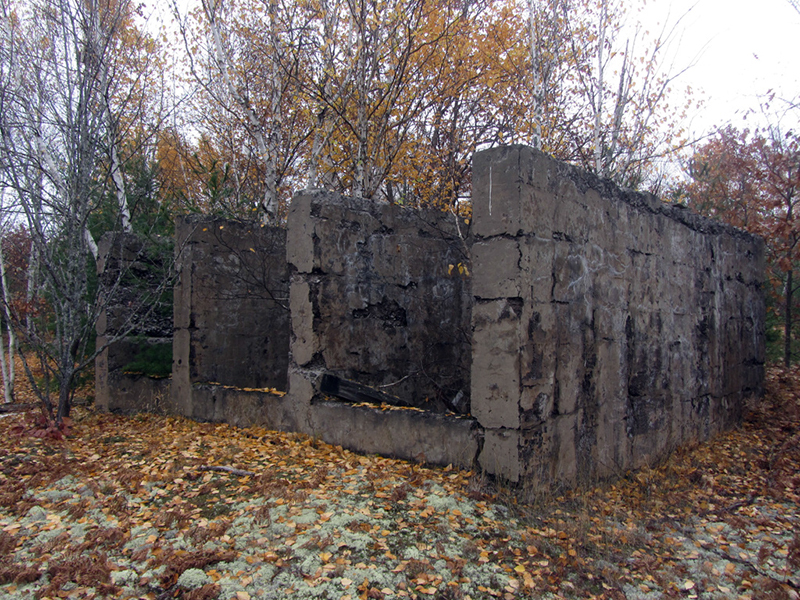 A stamp mill, Mike explains, is typically a huge terraced concrete foundation built near a large body of water, whose stepped levels provide places for the mill’s bins, stamps, jigs, and wash tables to handle copper ore in successive stages as it is moved on its way through the refining process. This layout allows for the optimal use of gravity in the transportation of the "slime" throughout the facility and its subsequent ejection from the launders. The material is referred to as slime because that's what it looks like when copper-bearing rock is ground down to super-fine consistency and mixed with water, so as to compel it to flow more easily through the machines and their processes. 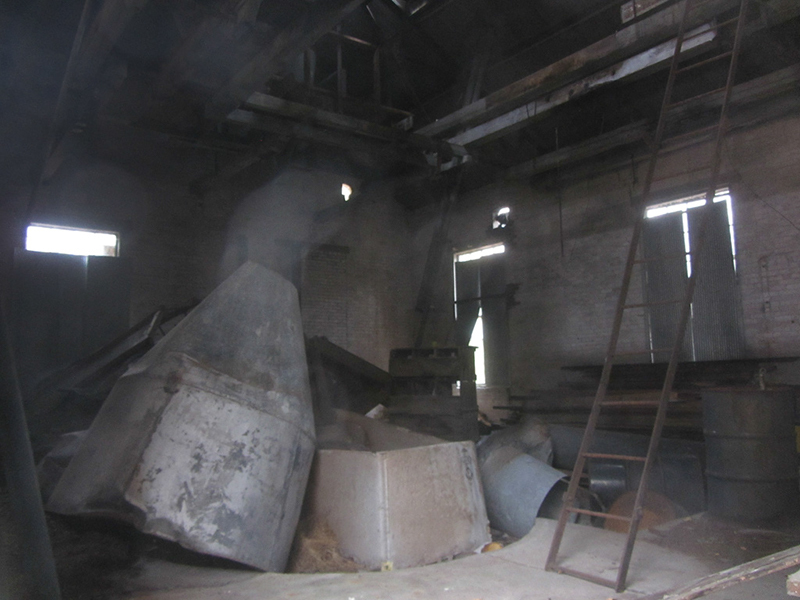 The ore starts out in large rock form in bins at the top of the mill, and goes into the stamps which break it down into smaller size so that it can be handled by the jigs on the next level down, and so on. 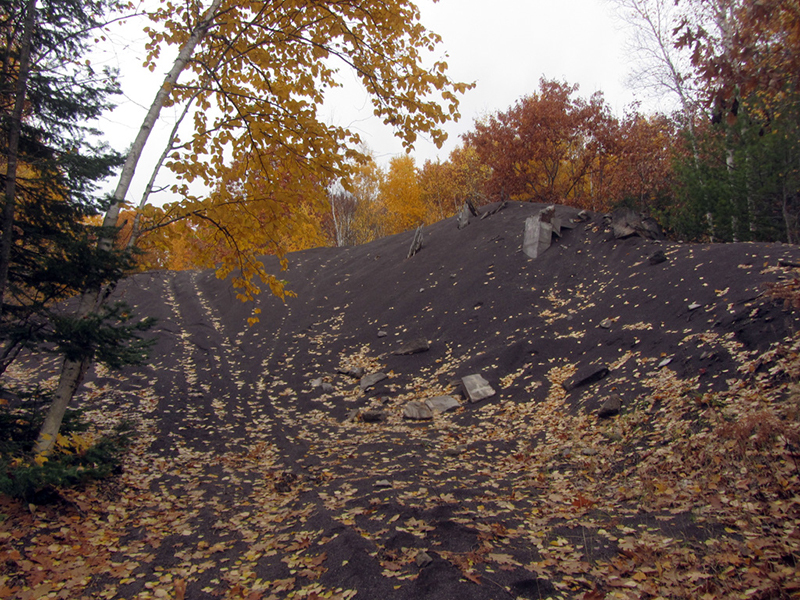 At the bottom of the mill, waste tailings are deposited in piles and the final product is loaded up on a train again to go to a smelter so that it can become actual copper. 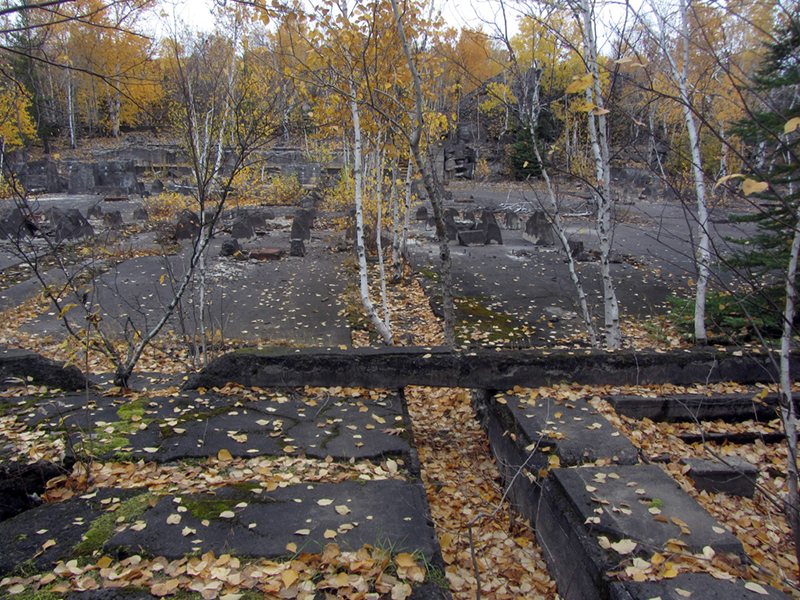 This stamp floor would have originally been home to three Nordberg stamps, with another three located at the opposite end of the building. These were huge steam-powered juggernauts that lifted and dropped massive steel hammerheads down onto the rock. 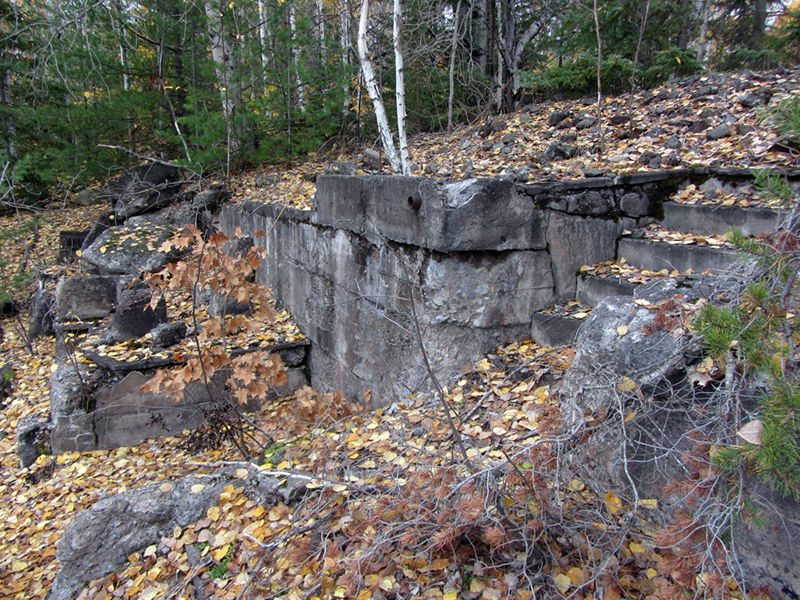 The six stamps at this mill had a daily capacity to handle 4,000 tons of rock, Mike wrote. 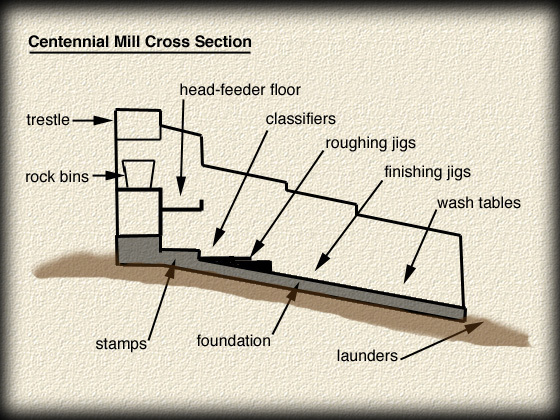 Here at the Arcadian / Centennial Mill, the stepped layout of the classical stamp mill formula was altered slightly to utilize only a couple of terraced levels for the stamps, rock bins, and roughing jigs, while the rest of the mill floor beyond that was simply a concrete slope, upon which angled foundations for the jigs and wash tables sat. 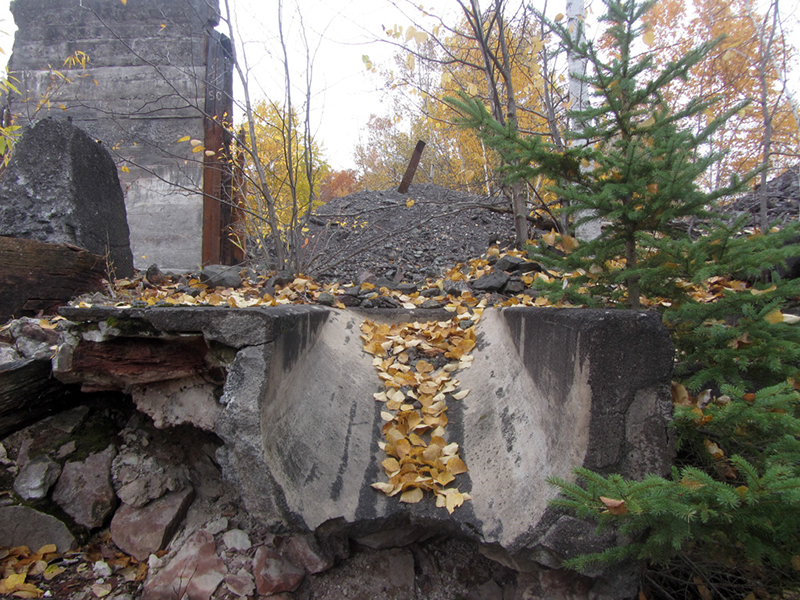 This was all that was left of one of the chutes, nowadays funneling more golden leaves than copper ores. 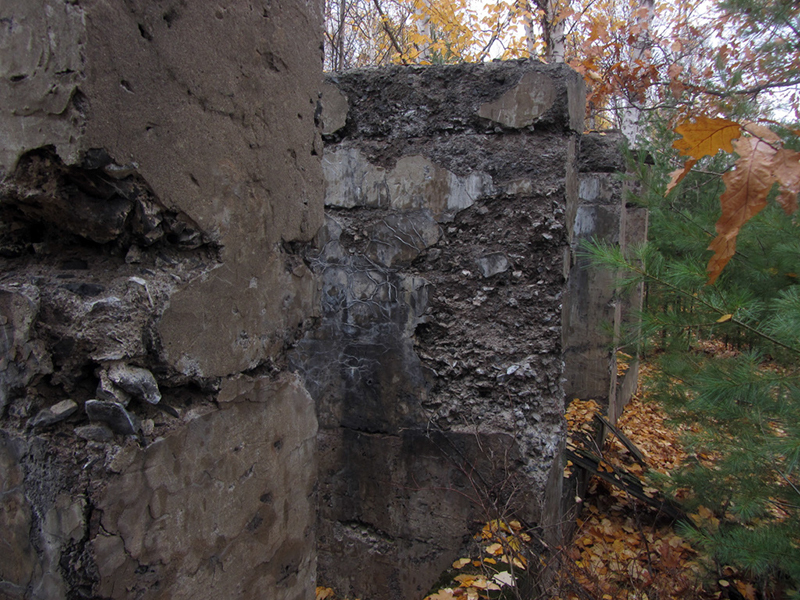 The tall concrete slab in the background is the last standing wall of the rock bin. 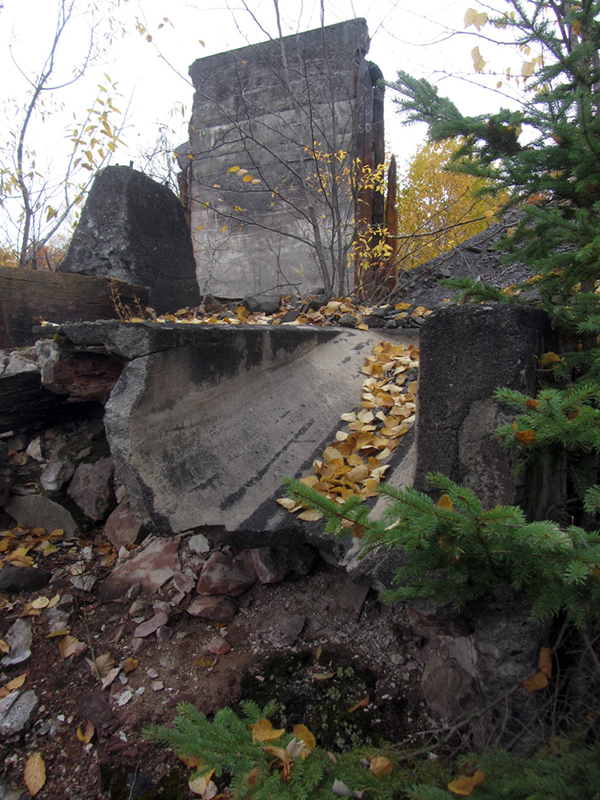 After the stamps, the copper ore is sent through a series of classifiers, which sort the rubble according to size. This sorted rock then goes down to the mill’s jig floor, first to the larger roughing jigs, and then the finishing jigs, being ground down to a finer and finer consistency. The final refining stage of the mill is a line of wash tables, which turn the now finely-ground copper ore into a slime by mixing it with water and separating out the heavier copper particles from the waste material. 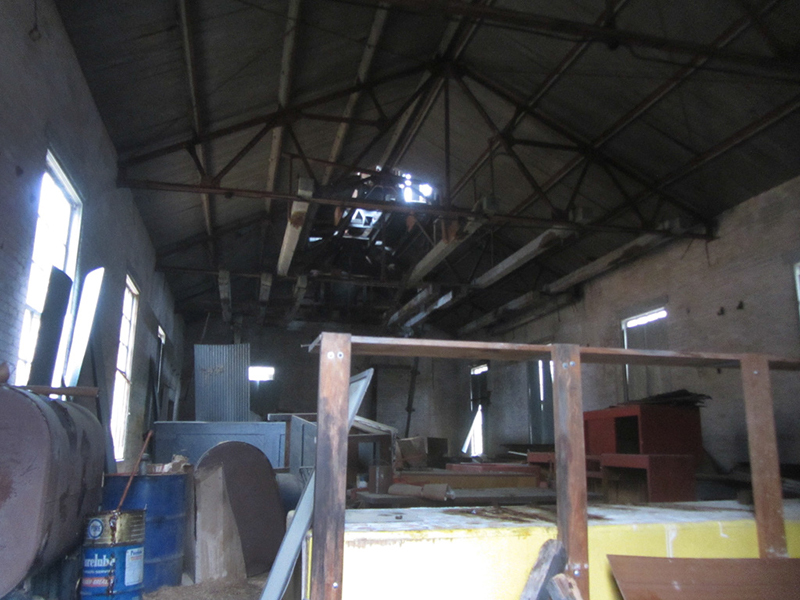 This flat open area of the mill floor, Mike says, was once home to the finishing jigs and wash tables. Originally there were 110 washing jigs and nine tables, but when Centennial upgraded the mill later those numbers were doubled. 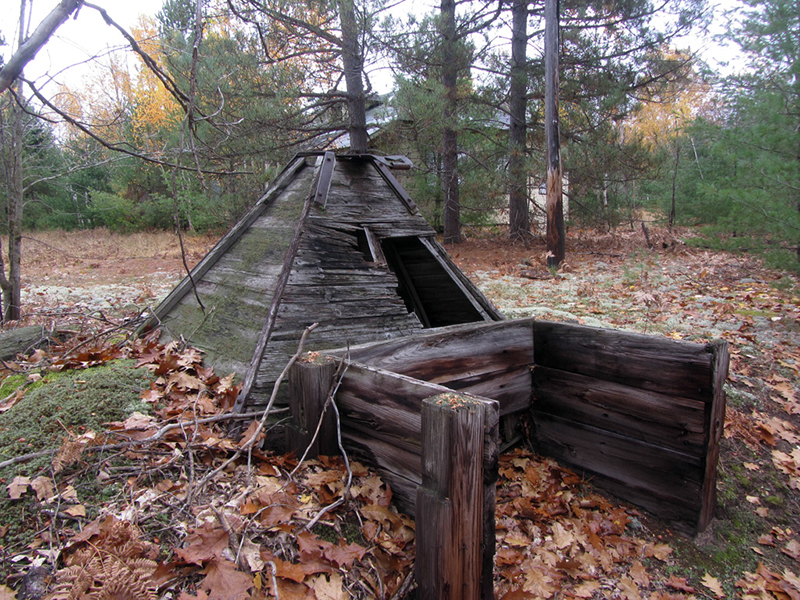 Originally the launders would have probably been lined with wood. 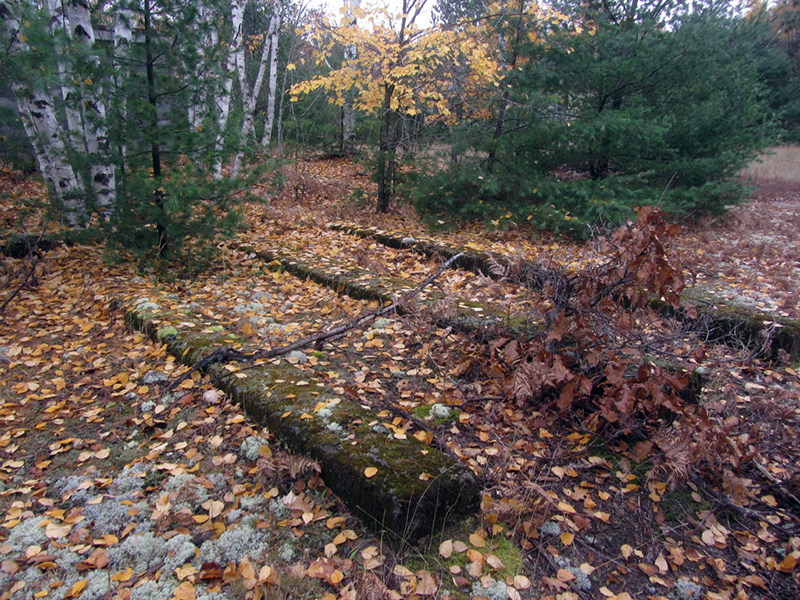 There were also a few rails set into the floor of the mill, along which tram carts would have moved. 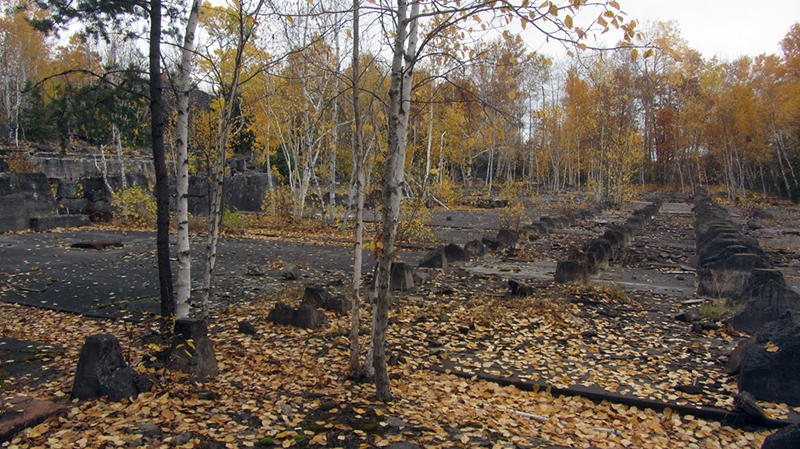 Toward the bottom of the mill was another series of stubby pedestals stretching across the floor, where the mill’s battery of wilfley tables was once located. 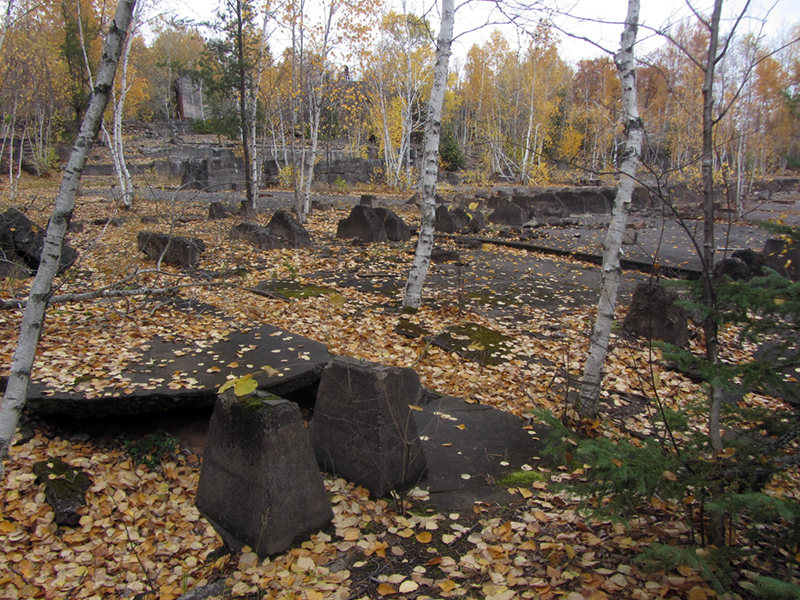 Mike says that when the Arcadian Mill was built, there were only a handful of wilfley tables in use. 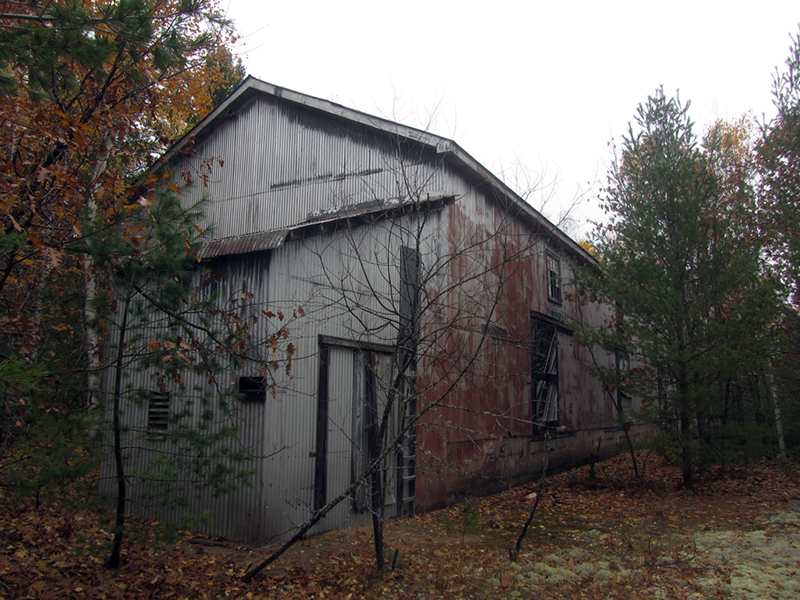 By the time Centennial took over this mill they were an industry standard. 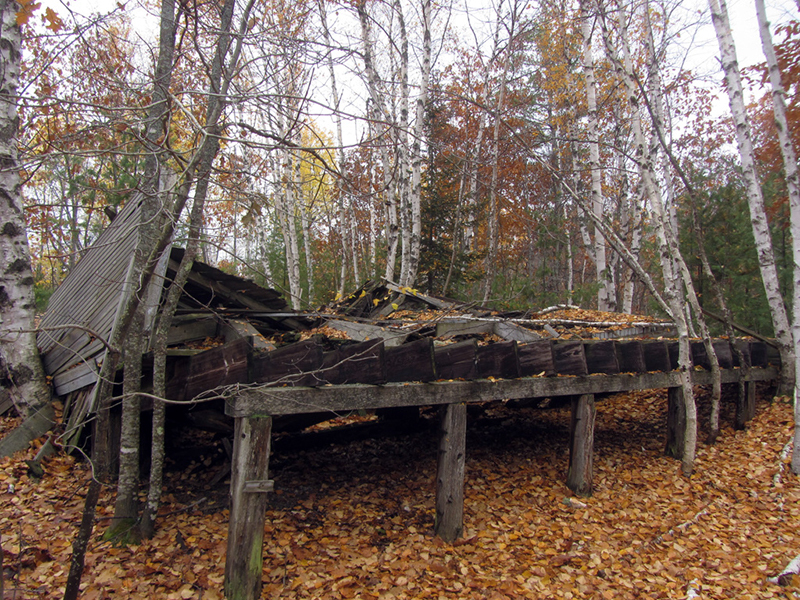 But like jigs, the wilfley tables were built of wood and would have rotted away long ago. 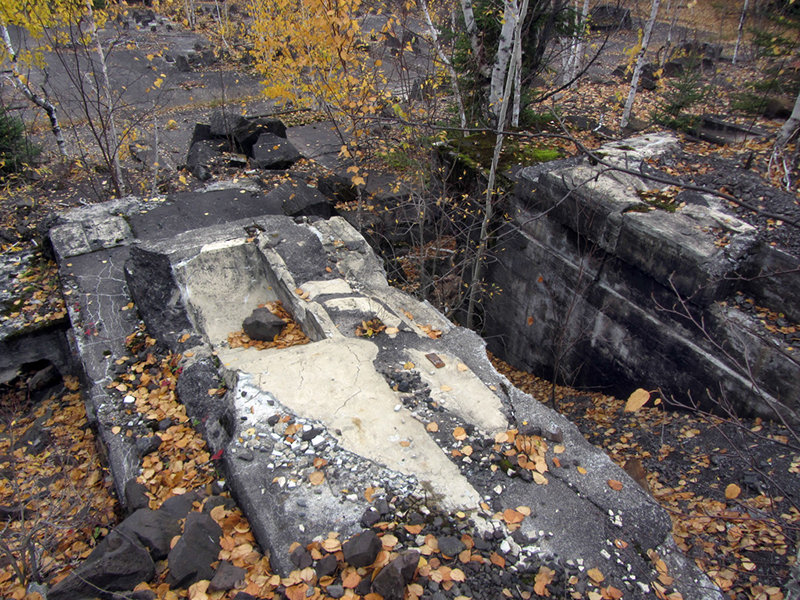 More likely they were removed, and reinstalled in some other mill. 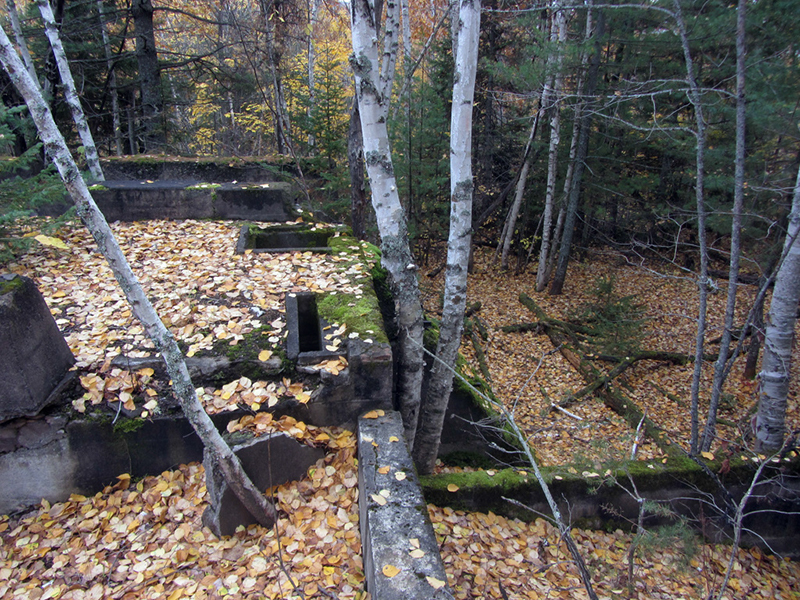 I had reached the very bottom end of the mill floor, and there was a very large trench running horizontally along it, as well as a few other curious structures. In Bulfinch's Mythology, Arcadia is a region of Greece, meaning "the place of Arcas," though it was also the favorite realm of the woodland god Pan. In Greek mythology, Arcas was a hunter as well as one of Zeus's innumerable illegitimate sons. Arcas and his mother Callisto were placed in the heavens by Zeus after being turned into bears by the goddess Hera, the jealous and vengeful wife of Zeus. Callisto became the constellation Ursa Major and Arcas became her twin constellation, Ursa Minor–the Big and Little Dippers–both of which circle around Polaris, the North Star, which shines at the tip of Arcas's tail. Thus it was referred to as the "Star of Arcady" by Milton in his poem Comus, in 1634. And now you have one more bit of trivial knowledge taking up space in your brain. 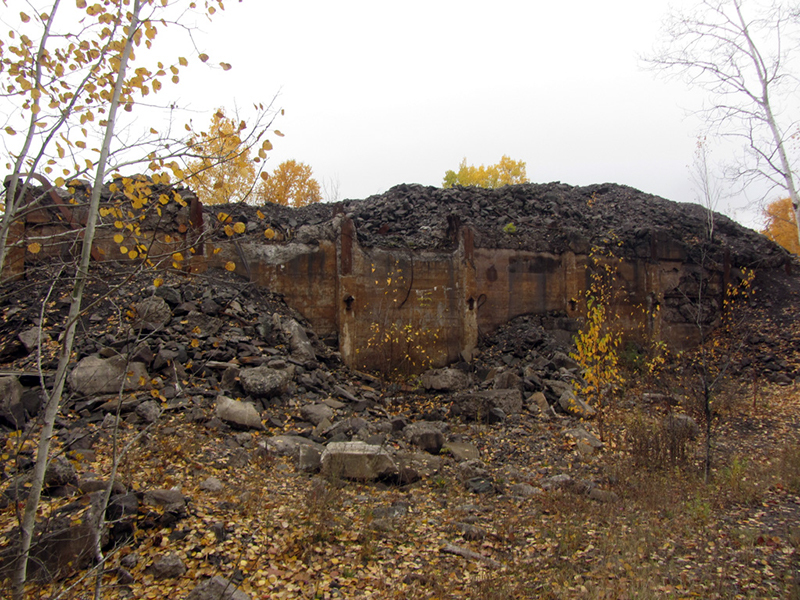 Waste mineral was washed away through launders and dumped into the lake (shhh, don't tell the EPA), while the good copper ore was deposited here via the tram carts I mentioned earlier, for delivery to the smelter by train. 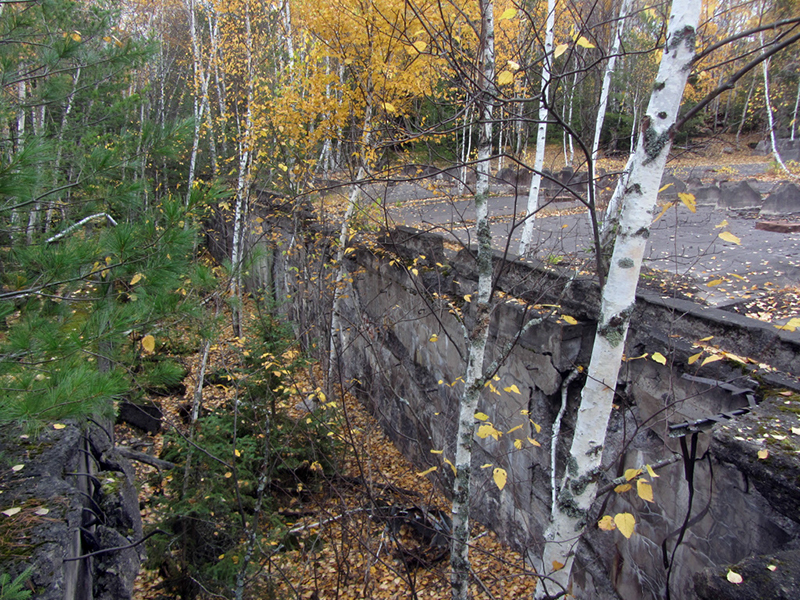 Down in the trench...where railroad cars were loaded up from above, before their trip around the lake to the smelter. 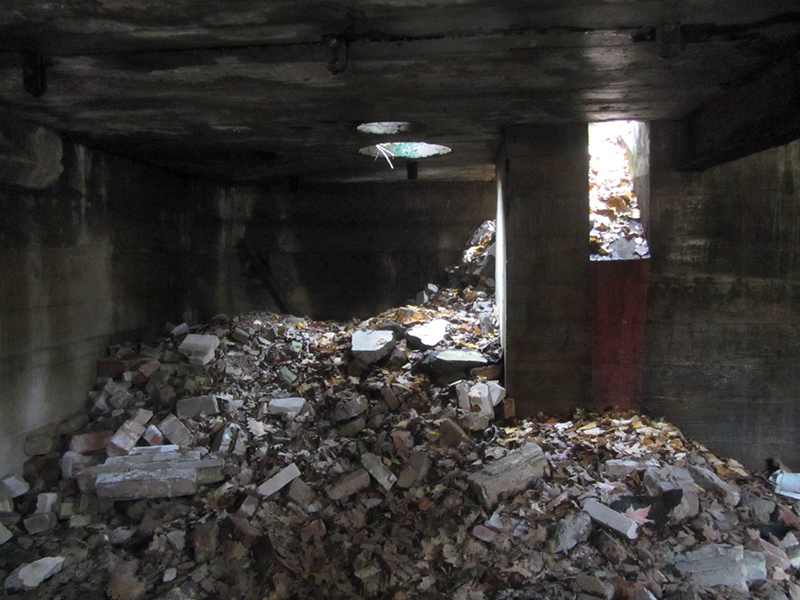 Climbing all the way back up to the top corner of the mill again, I found a weird area that was recessed like a pit, down below the level of the rest of the mill floor. 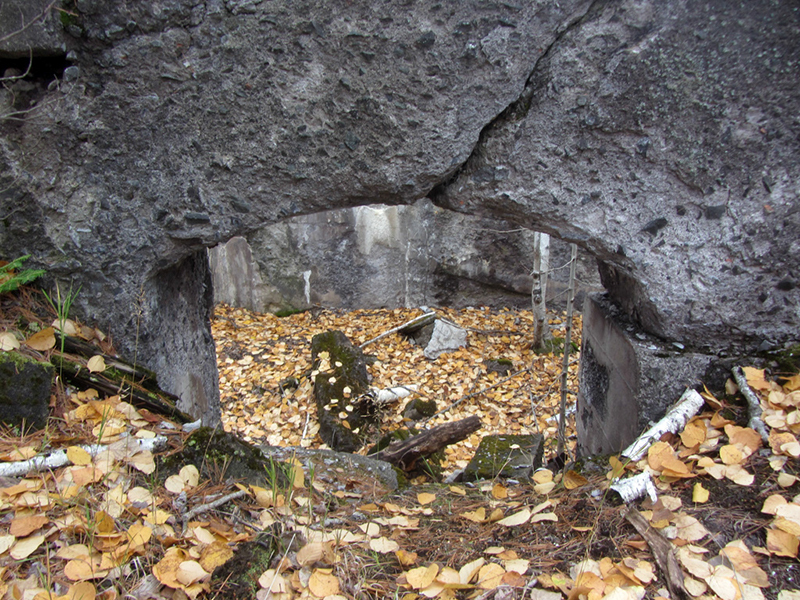 Inside there were a couple pyramid-shaped pedestals, of no discernible purpose. 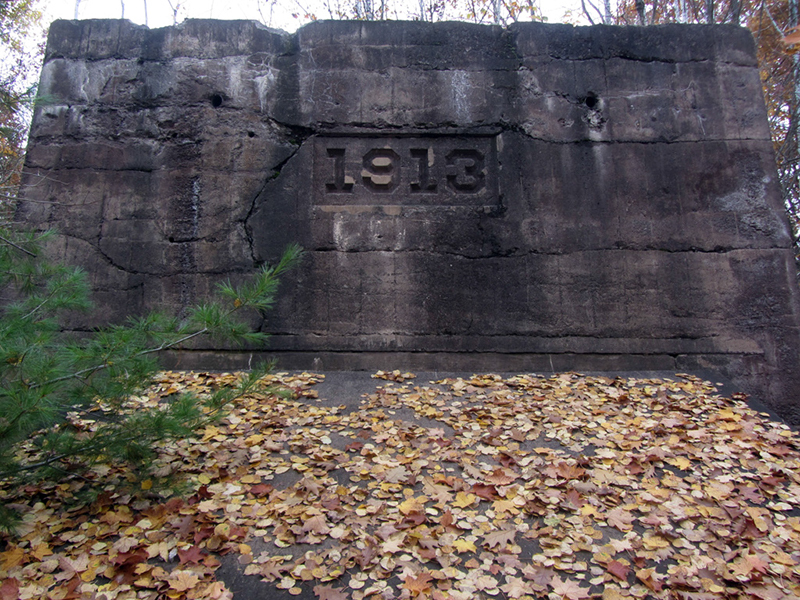 Some were concrete, but at least one was sandstone. 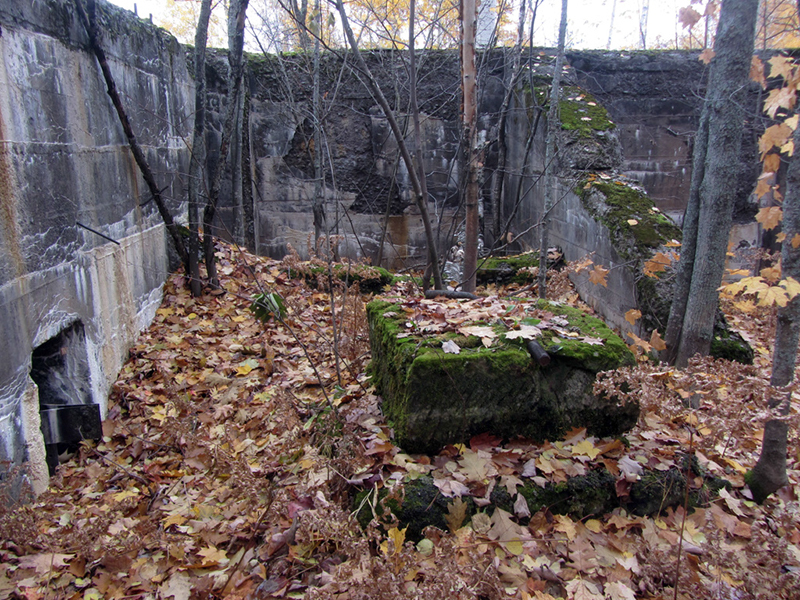 Mike Forgrave puzzled over this same feature, and found out that it was actually part of an unfinished addition to the mill that was started in 1928. 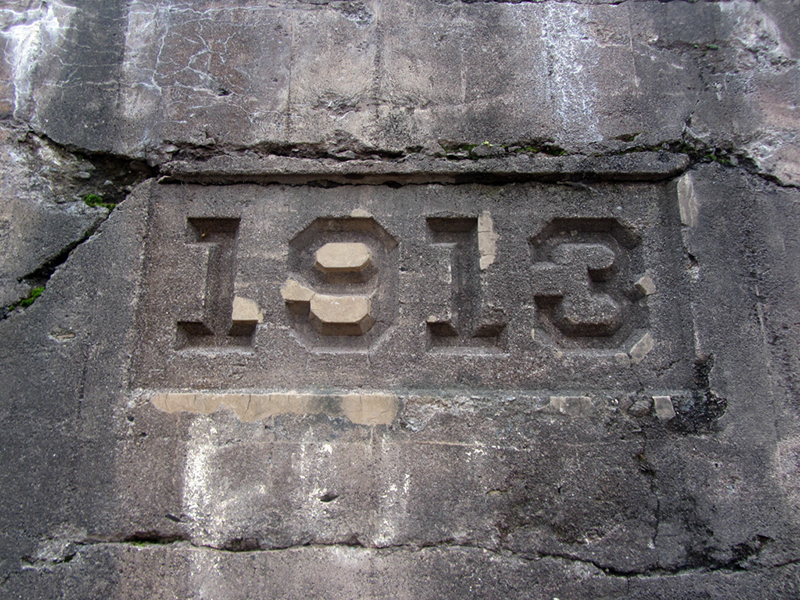 As early as 1917 the company had been planning to expand this mill again. They wanted to add two more stamps to its current compliment of six. They were also going to add more jigs and wash tables, as well as four more boilers to support this increase in production capacity. 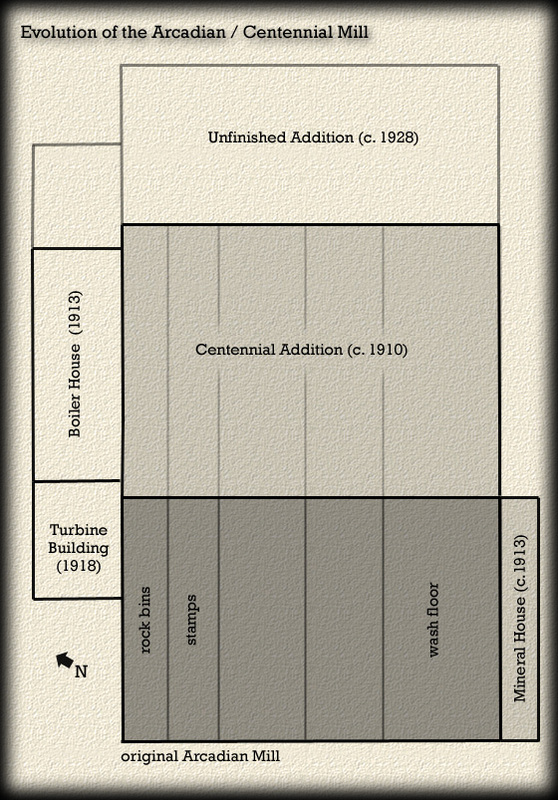 Mike made another cool graphic showing the progression of additions made to this mill over the years. 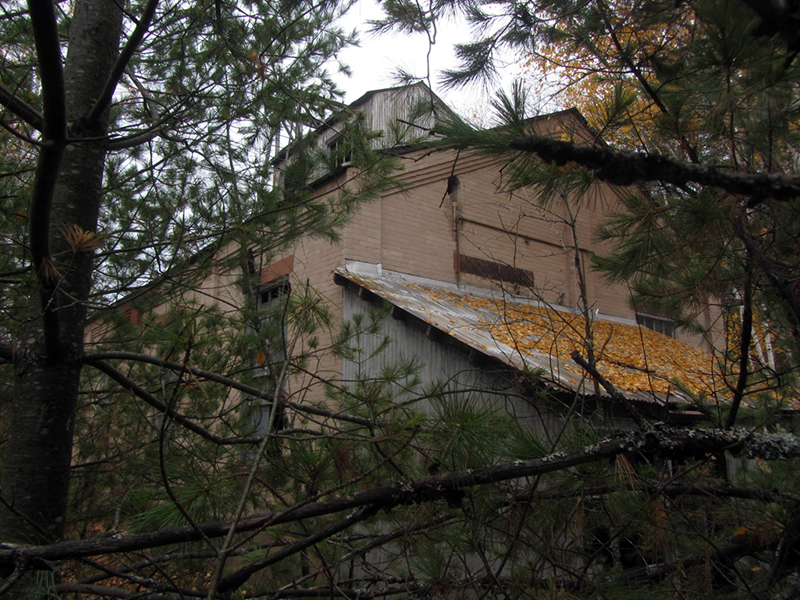 Soon after this expansion started however, the mill was shut down forever and the new phase was never completed. He said that it could have supported a small steam engine, most likely to power the movement of the stamps themselves. 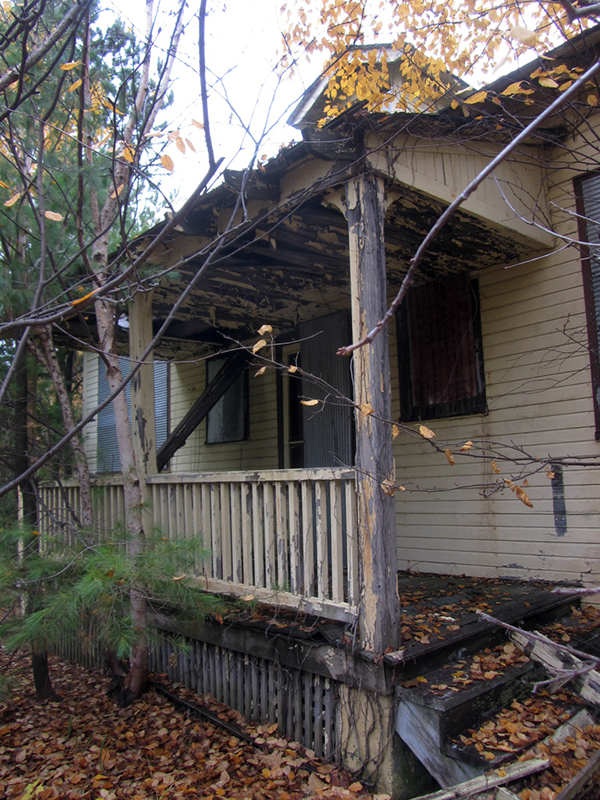 Some early Sanborn maps denoted the existence of a 150-horsepower engine in this general area he said, so that's most likely the case. 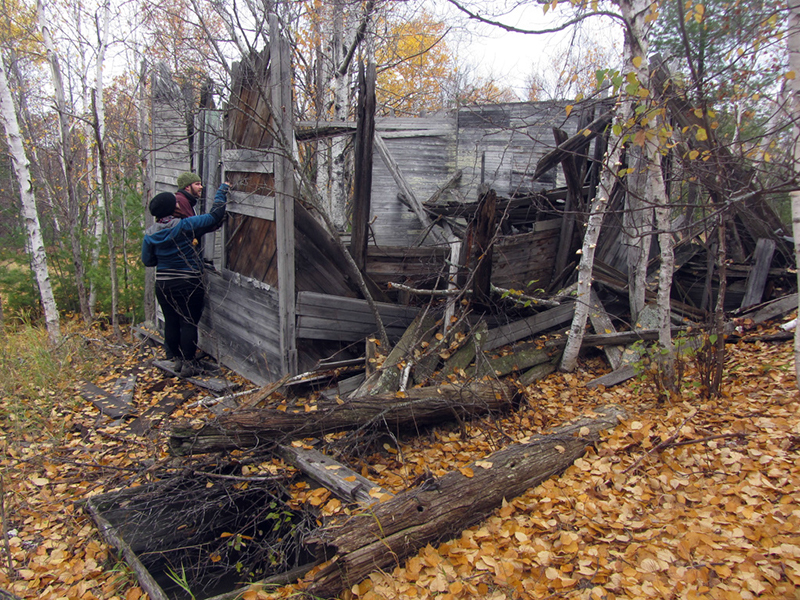 There were more picture-worthy ruins to see down by the lake shore where the mill's pump house and docks were located, but we did not make it that far. 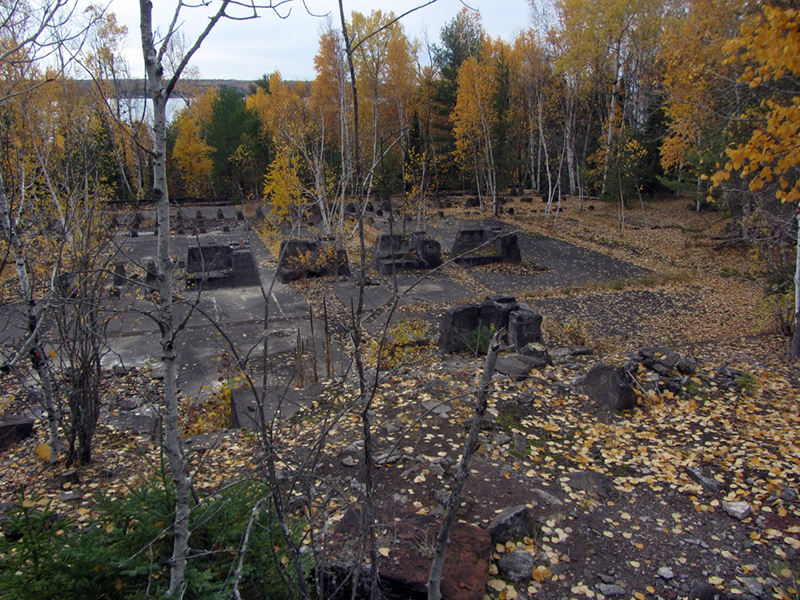 The ghost town of Senter was once a company village and dynamite factory that supplied the mines of Michigan's Copper Country, nestled in the middle of the lonely Dollar Peninsula, which juts between Torch Lake and Portage Lake, in the middle of the Keweenaw Peninsula. A peninsula within a peninsula...of a peninsula. 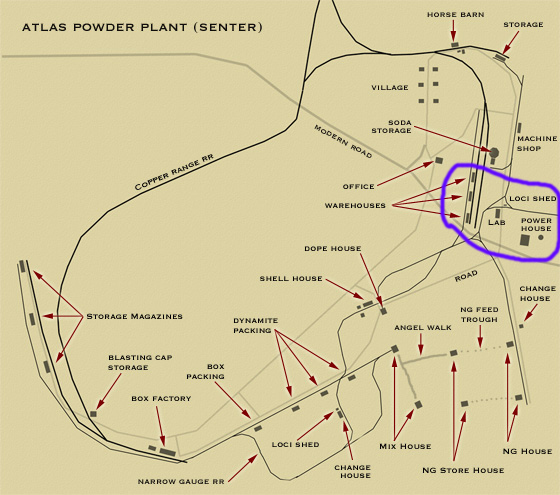 The Atlas Powder Plant is enormous, covering over 1,800 acres and consisting of over 240 buildings. It's easily the largest site I have ever explored for CCE; requiring over five hours, 400 photos, and (so far) 15 posts to cover. But I’ve only just scratched the surface. 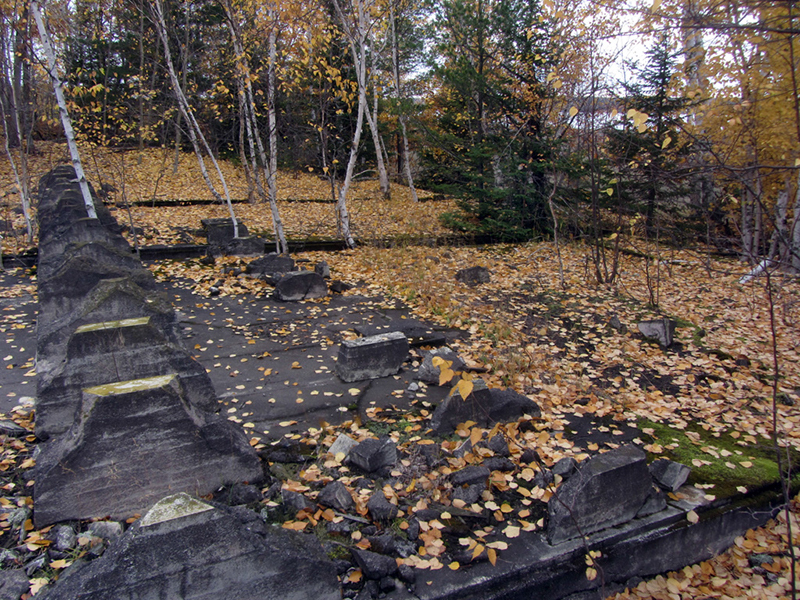 The only books I have on my shelf that discuss the Atlas Powder plant at all are Lawrence J. Molloy's Guide to Michigan's Historic Keweenaw Copper District, which briefly notes that it operated from 1910 to 1960. The other is David M. Brown's Michigan County Atlas, which calls this plant the "E.I. 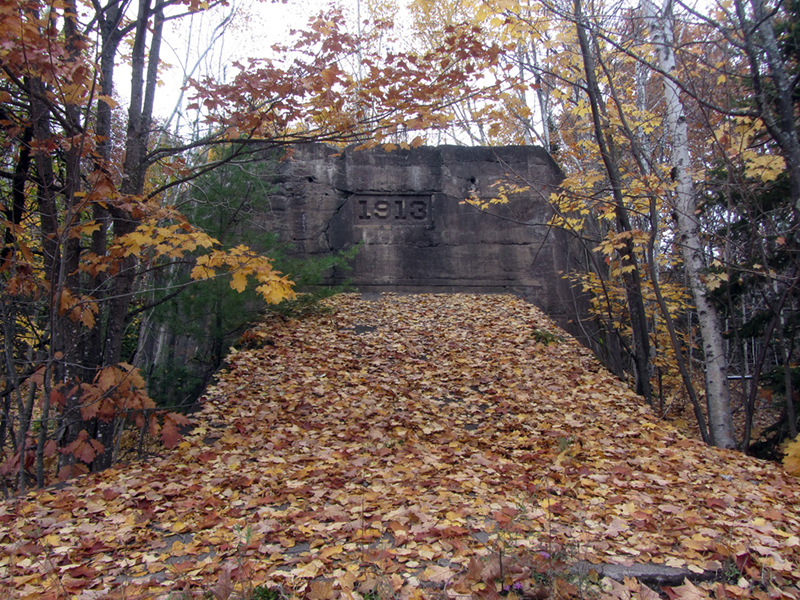 du Pont de Nemours Powder Co." and says that Senter's population reached 40 people in 1915. It had a post office, but I'm not sure how the name "Senter" came about. 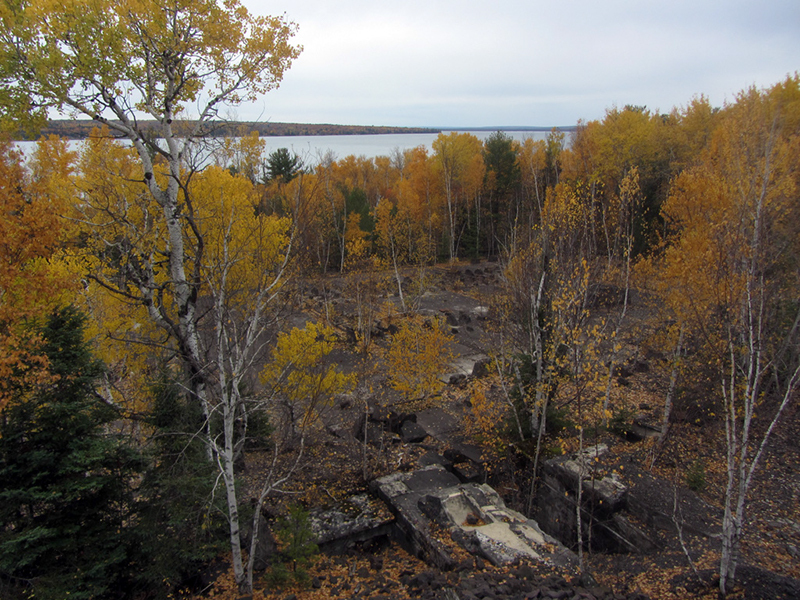 It is perhaps worth noting that Senter Point on Isle Royale was named after prospector John Senter in 1847, who helped open the Siskowit Mine there...I wonder if they both somehow share a namesake? A quick Google Books search indicates that in the 1870s there was another prospector named Charles Senter, who discovered molybdenum deposits out in Leadville, Colorado. 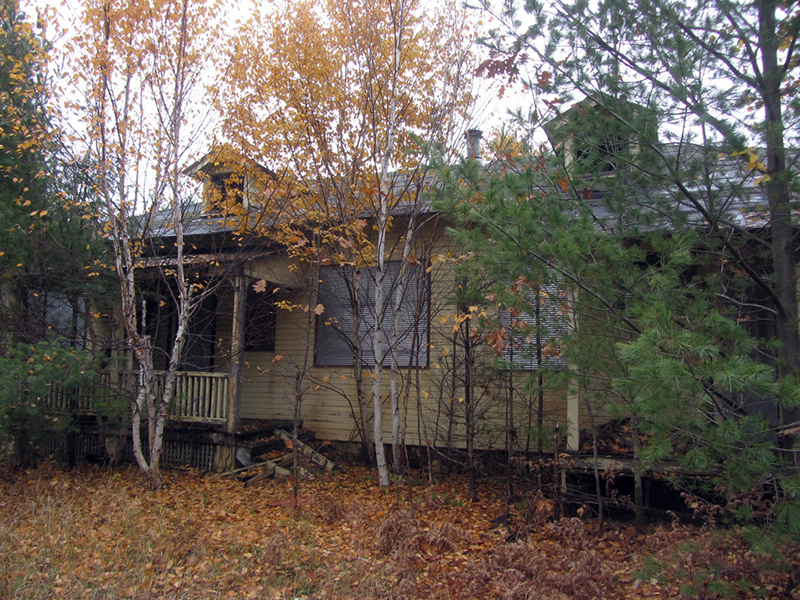 A Wikipedia (pardon me) entry says that the Senter family were residents of nearby Houghton, Michigan, and the patriarch of that household was John Senter, a wealthy merchant from New Hampshire. He had a son named Henry M. Senter who became a University of Michigan football star in the 1890s, and later moved to Colombia to start a coffee plantation. 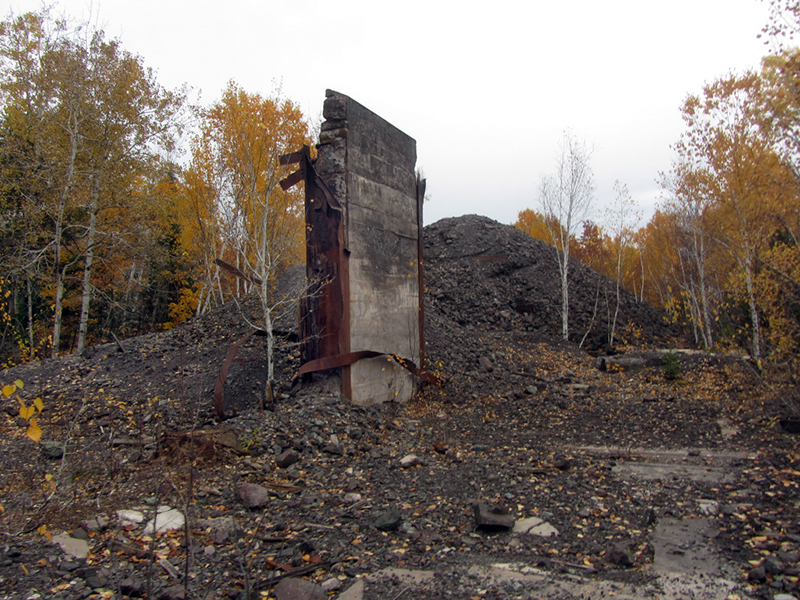 Anyway, according to CopperCountryExplorer.com, the mines of the Copper Country were generally self-reliant "except for three things which they could not find along the peninsula: coal, iron, and explosives." These were shipped in from far away, naturally at high cost, until the owners of the Tamarack and Osceola Mines decided to invest in building an explosives plant at Woodside, just north of Dollar Bay in 1884. 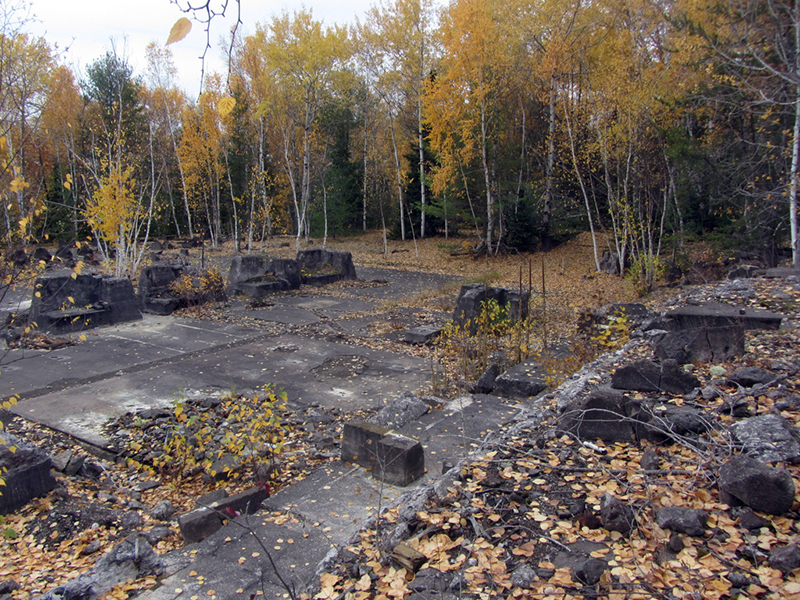 It was called the Hancock Chemical Co.
Then the big conglomerate Calumet & Hecla began buying out all the Copper Country mines in the 1900s–including the Tamarack and Osceola–and DuPont ended up acquiring the obsolete Woodside plant through a separate merger. 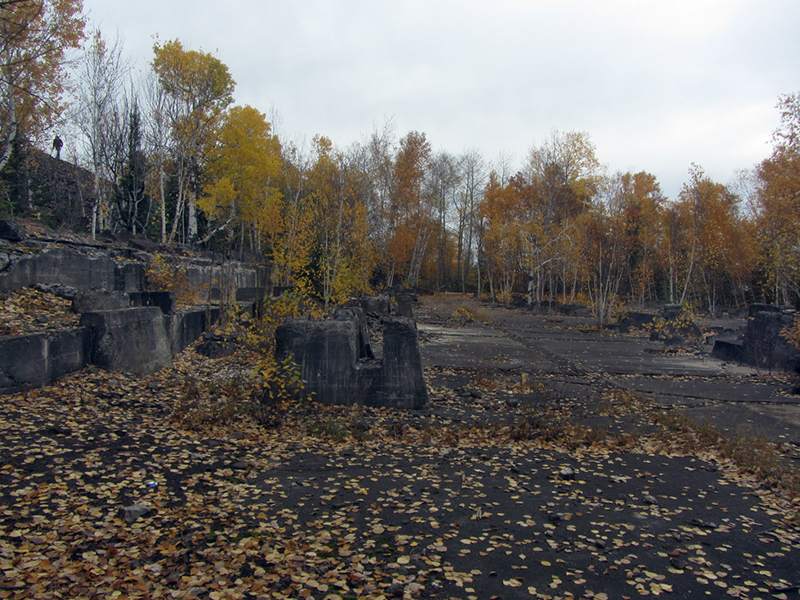 Both Calumet & Hecla and DuPont decided to jointly invest in building a new, modern explosives manufacturing facility within the Copper Country, here at Senter. It was called the Atlas Powder Co. 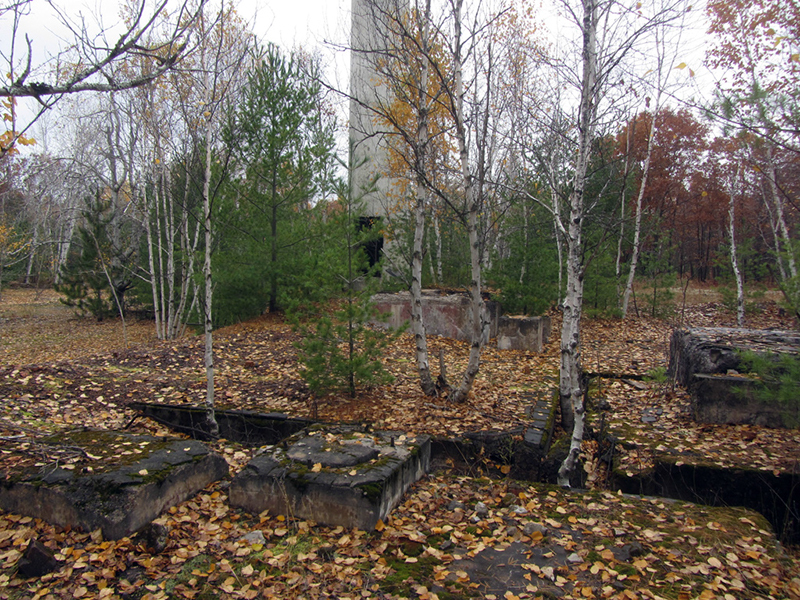 The old Woodside dynamite plant was known for accidentally blowing up on occasion, so there was much greater care taken to design this new plant with safety in mind, and they made sure to place it as far from civilization as possible. 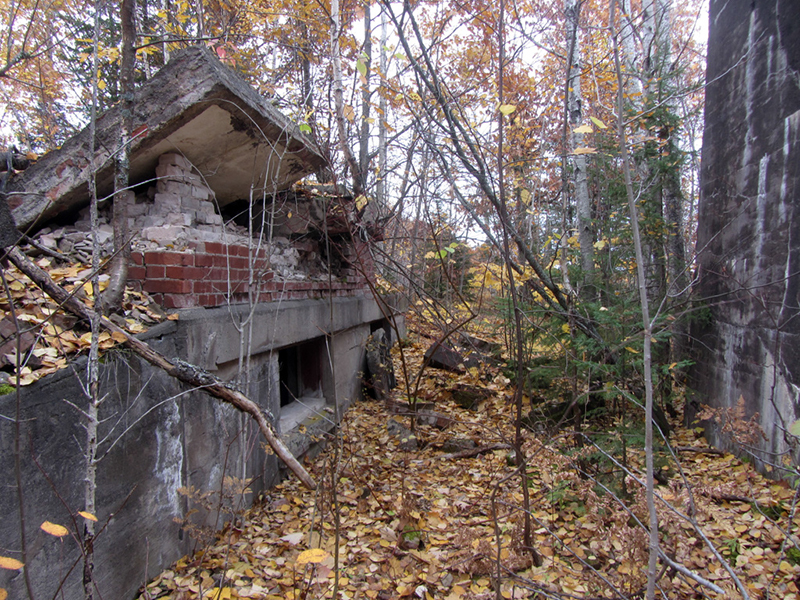 This site, nestled deep into the Dollar Peninsula was ideal–it was geographically close to the epicenter of Michigan's copper mining activities, yet the area was remote enough to where it wouldn't destroy any towns if it blew up. 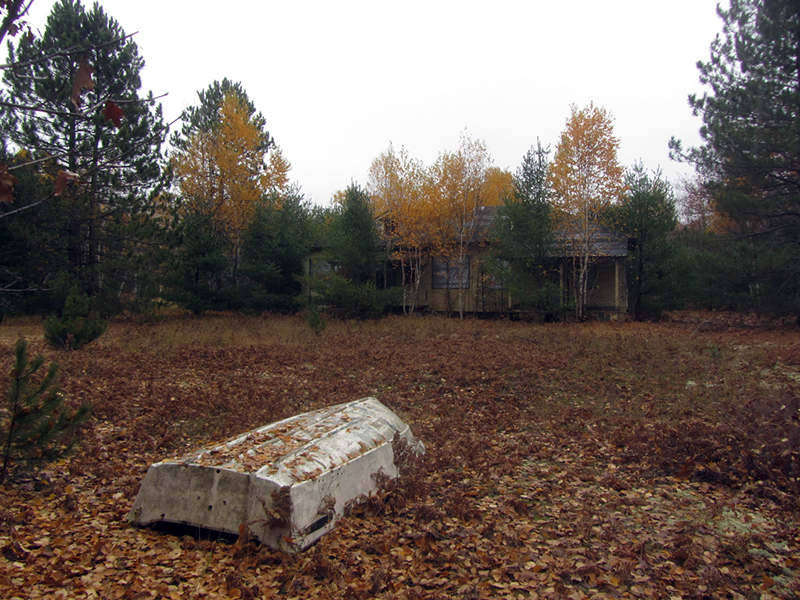 The nearest town is Dollar Bay a few miles to the west, and Dreamland, on the other side of Portage Lake. The plant began operating in 1910, and as far as I know it never blew up. The thing that makes finished dynamite safe to handle–as opposed to raw nitroglycerin, which can explode merely from being handled roughly–is dope, an inert filler (like sawdust) that blends with the nitro to improve its shock resistance. 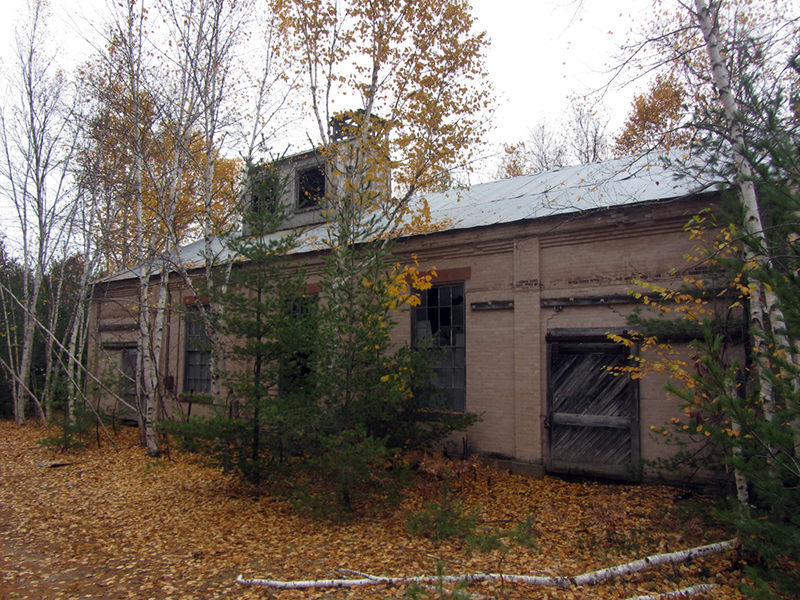 This brick warehouse was a drying house for the pulp that was used to make the dope here at Atlas Powder, according to CopperCountryExplorer. The cupola on top of the building was for venting the steam that was generated in the process. 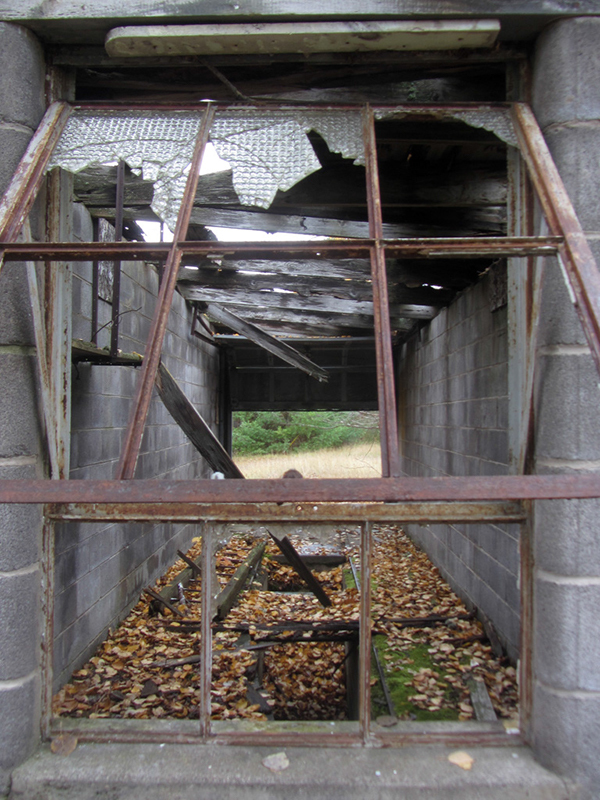 During World War II most chemical and explosives plants across the country were converted over to manufacturing munitions for the war effort, but the Atlas plant at Senter was exempt from this, and took part in the war in another capacity. 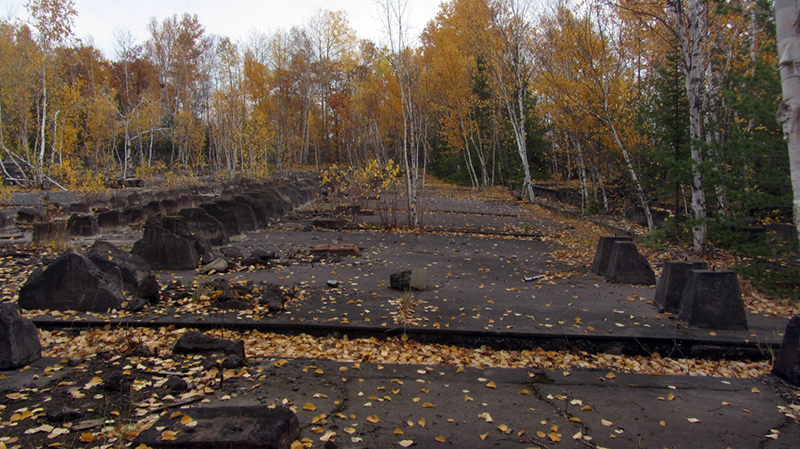 Since copper was just as crucial to making munitions as high-explosive, Senter's plant was ordered to keep making dynamite exclusively for the mines of the Keweenaw during the war, and in fact they stepped up their production capacity quite a bit for this. 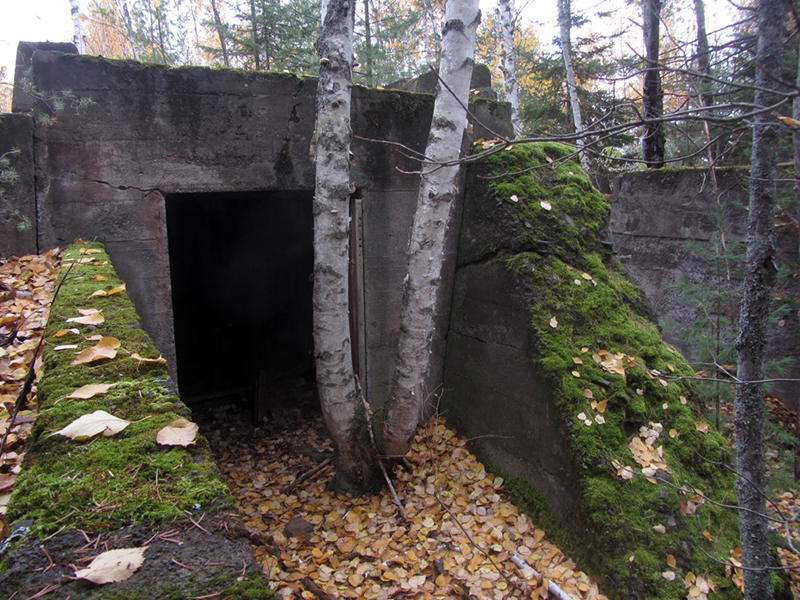 Copper mining was absolutely crucial to the Allied war effort, because without copper there could be no bullets or shell casings, and Michigan's Keweenaw Peninsula was still by far the richest copper range in the U.S. at the time. 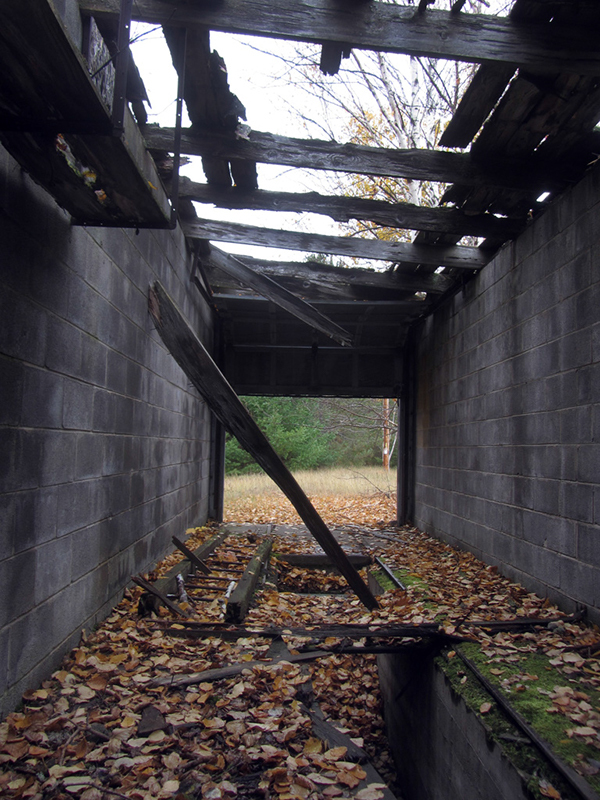 Nitroglycerin, an ingredient in dynamite, can be extremely unstable, and is sensitive to physical shock. Since Atlas was going to have so much of this dangerous stuff around, as well as other explosive chemicals, the plant and its processes had to be designed with safety foremost in mind. The most obvious of these precautionary measures was to keep the various buildings spaced far, far apart, which is why this complex is so vast. 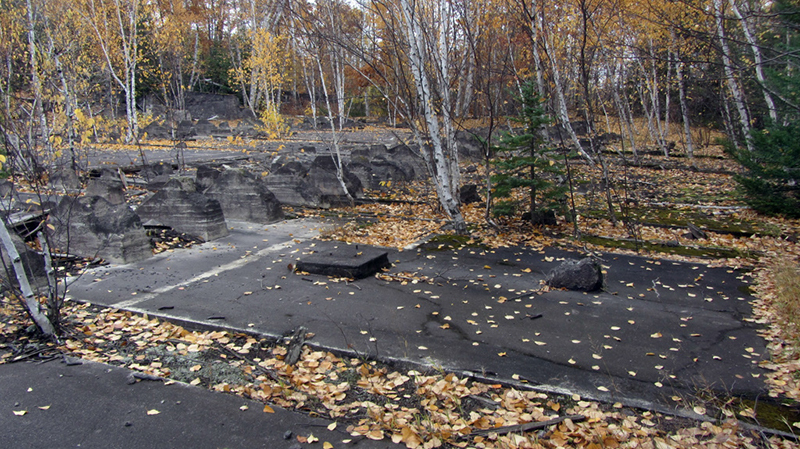 The components of the dynamite product–blasting caps, nitroglycerin (NG), soda, and dope were all kept in separate buildings in separate areas of the plant before being combined and shipped. Certain steps of this assembly process were very risky, namely the parts that involved transporting the nitro to the mixing houses. CopperCountyExplorer says that the assembly line alone measured about half a mile in total length...pretty big, for a final product that's smaller than your forearm. It was all done this way so as to avoid an accident being able to set off a chain reaction. 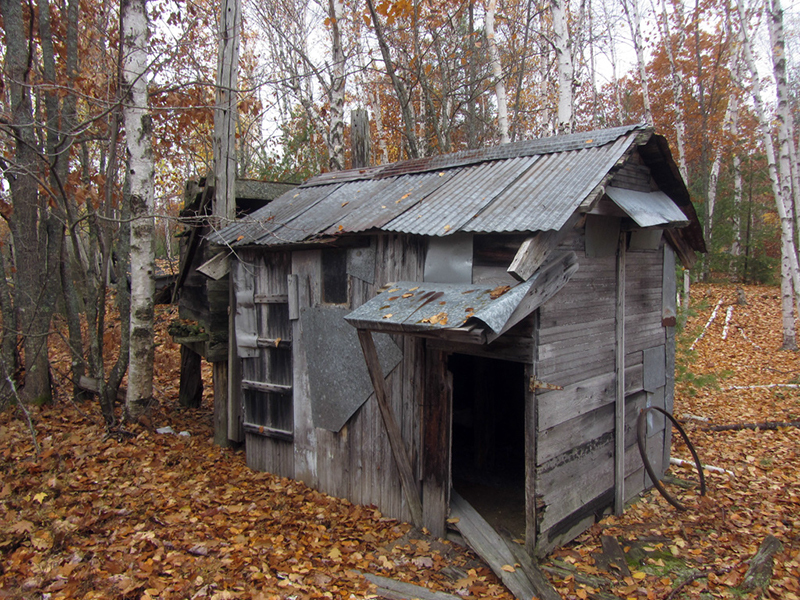 I'm not certain what this tin shed was used for, other than more warehousing? It looked like it had been built in maybe the 1930s? 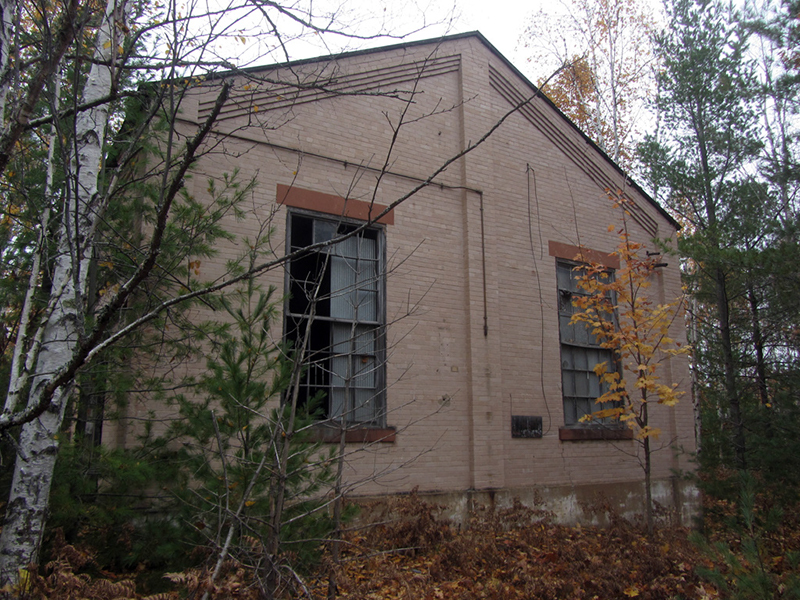 According to Mike, this was actually the Atlas Powder Co.’s laboratory, "where new products and new techniques for explosive manufacturing were researched and tested." The style of building really reminded me of the types of houses and buildings I had seen in the mining ghost town of Gilman, Colorado. ...somebody's hunting blind? 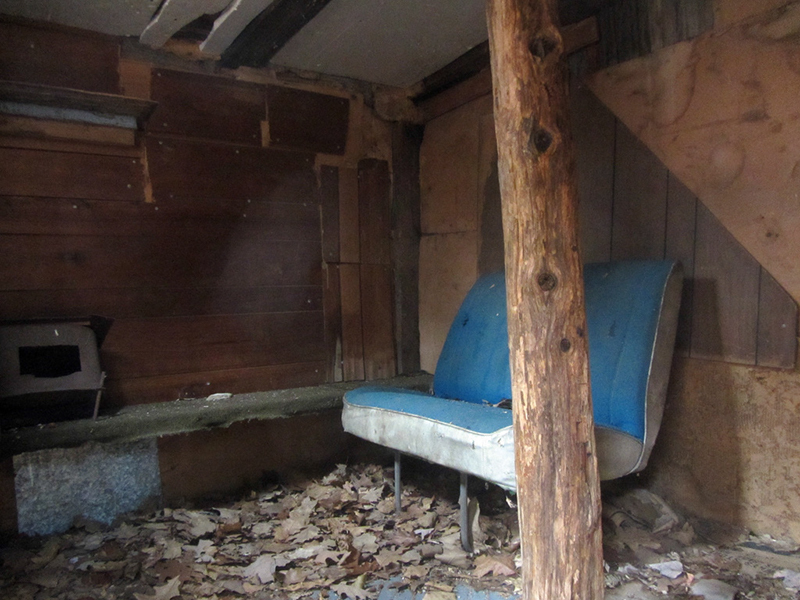 Oh yah dat's a sweet blind 'dere eh, you betcha! 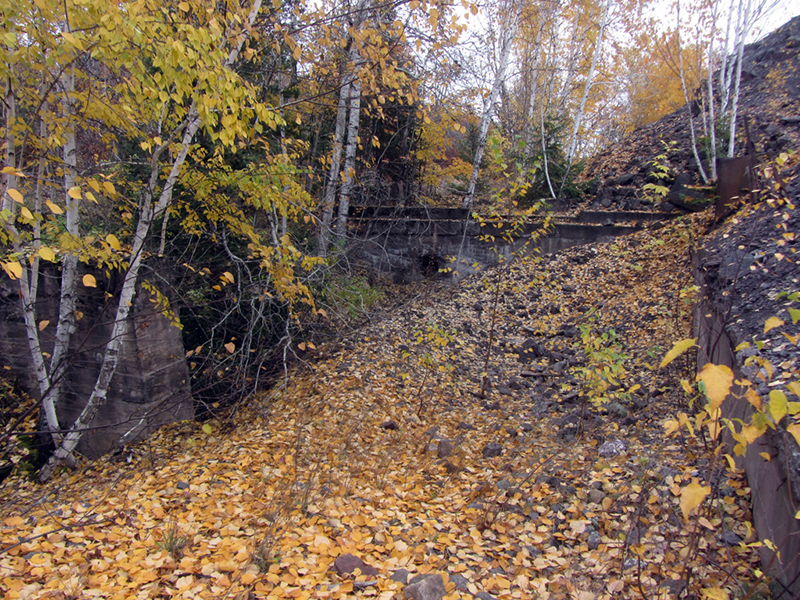 All of the pathways here used to be narrow-gauge railroad tracks, except for the main branch of the Copper Range RR. 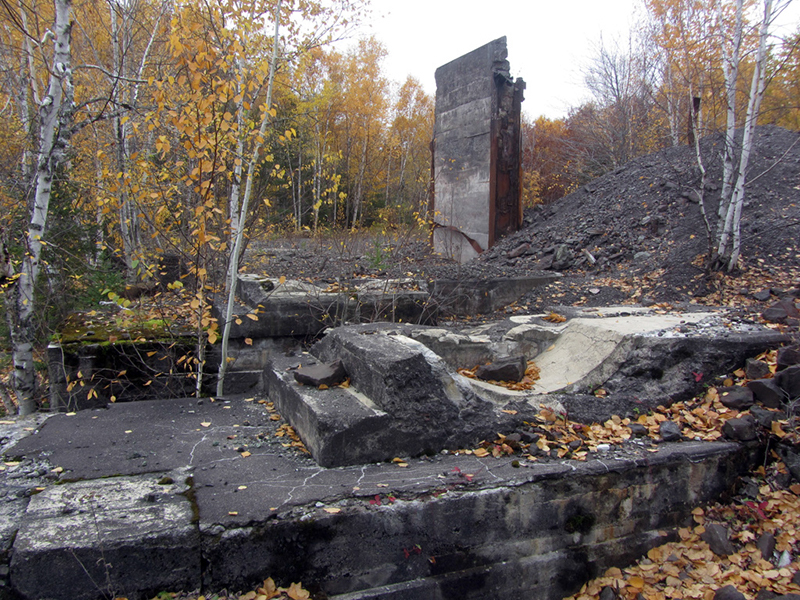 Naturally since it was in the middle of nowhere, Atlas Powder was required to generate its own electricity and steam heat, and therefore needed to build a powerplant. 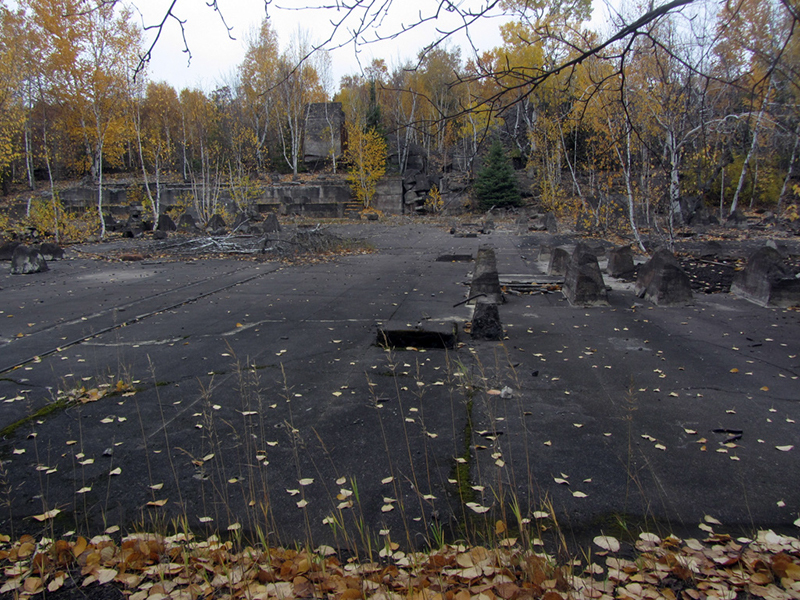 But according to CopperCountryExplorer, they also had need of a few other special supplies that were unique to an explosives manufacturing plant, such as refrigerant, brine, and compressed air. These things were piped from the powerplant through elevated distribution lines that stretched throughout the vast complex of buildings. 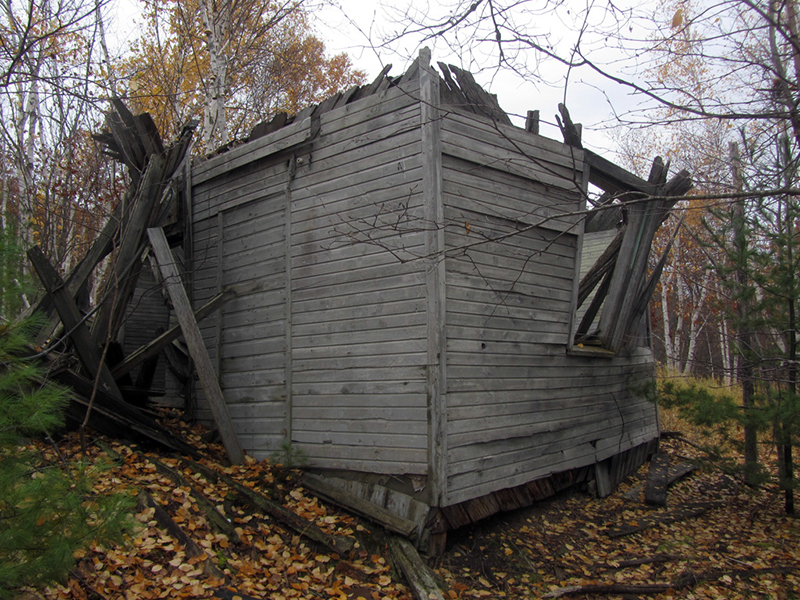 Mike wrote that there were originally three of these little huts, one for each locomotive that Atlas Powder had at the time. Apparently they were commonly referred to by employees as "locis" (I imagine that is pronounced "LO-ki," as in short slang for locomotive). Since combustion-powered machinery was too hazardous to use on site near high-explosives, Atlas kept using horses to pull their carts all the way up until the 1950s, when they finally got the electric locomotives. 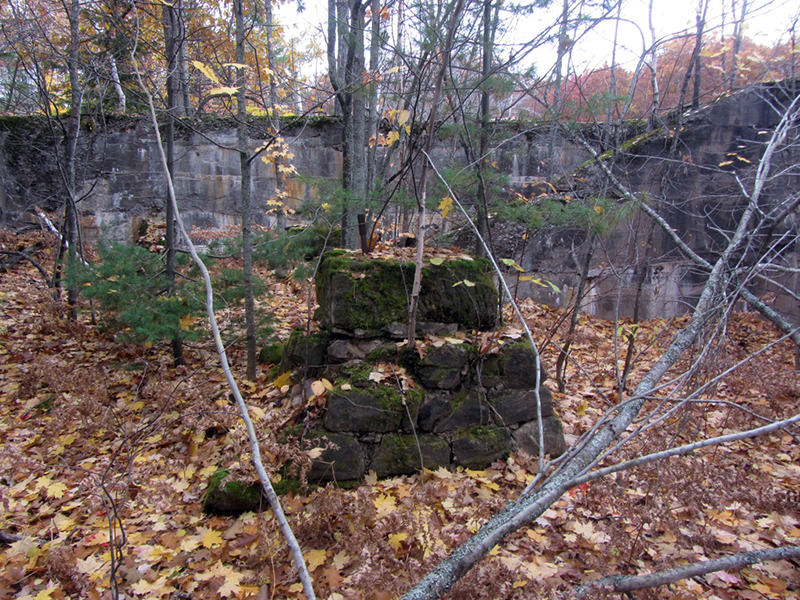 The ruins of the old horse stables are actually still standing, just a little ways north of here into the woods. ...reminds me of my young greasemonkey days working at a Quaker State oil change garage. 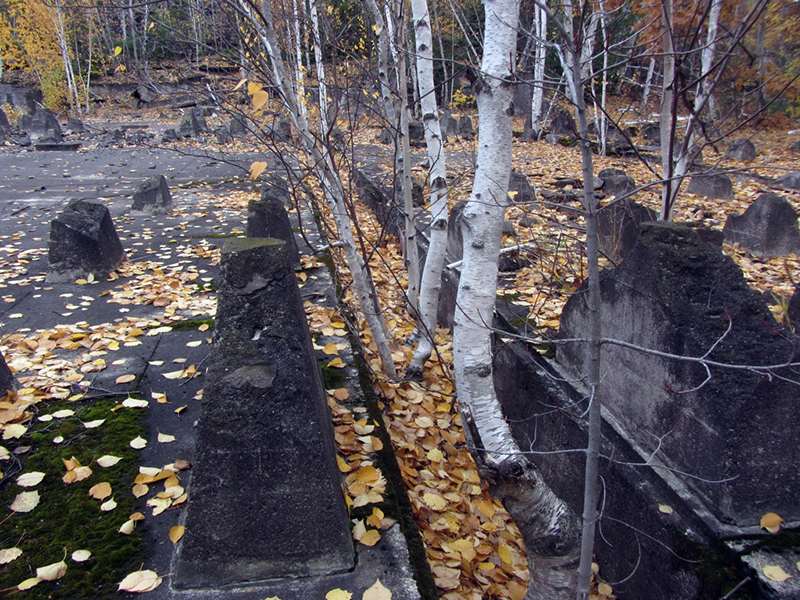 It seemed like everywhere we wandered there was something else, some other minor structure or ruin that was connected to the plant in some way. We didn't wander much farther than this point however, since we had to be getting back home. Update: I just noticed my colleague Rev. 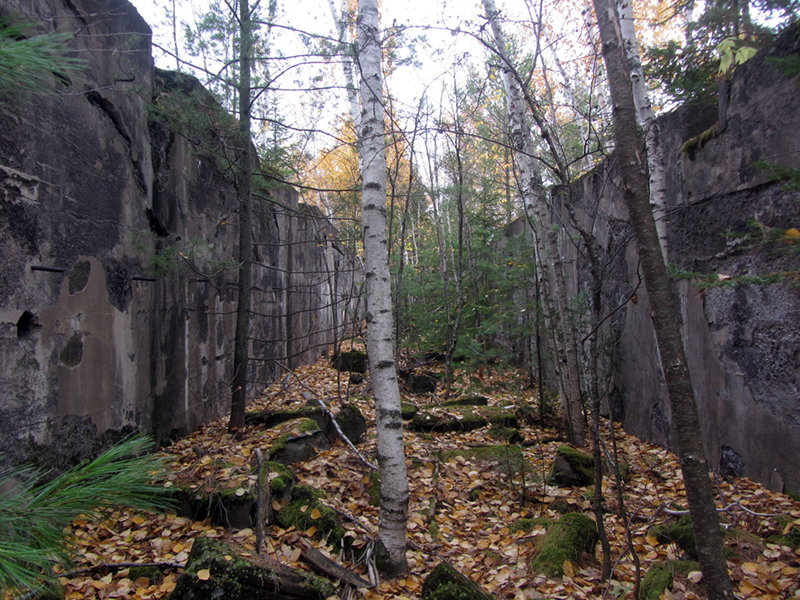 Aldinger also has a detailed entry for the Senter plant on his website, Copper Country Maps.